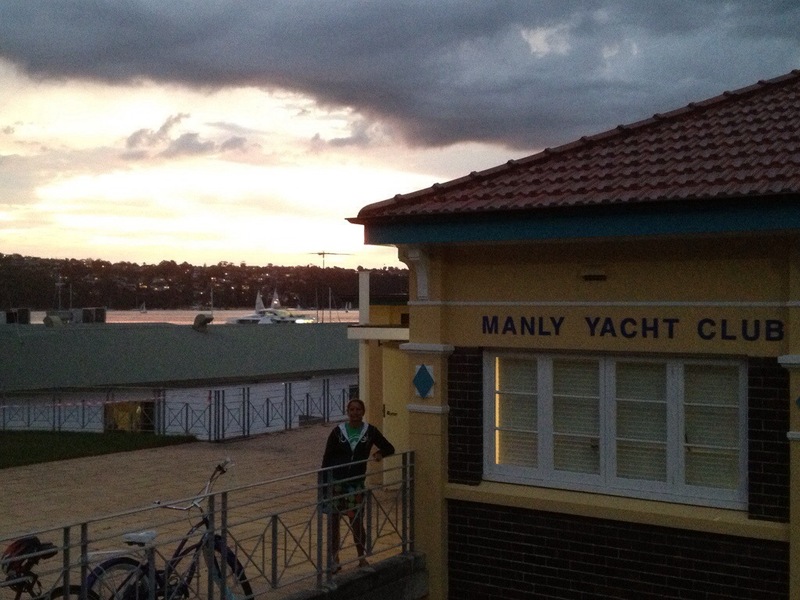 We had heard about Manly Beach from some of the people we did the Whitsundays sailing trip with. 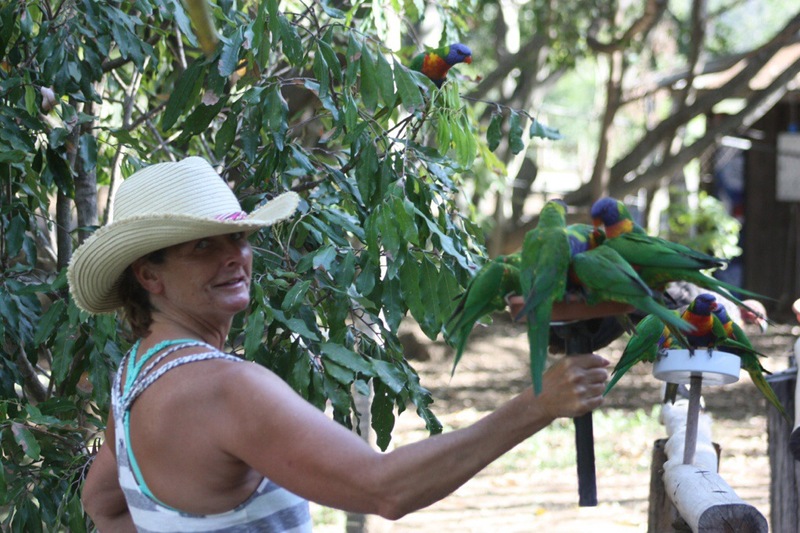 They love the place, so we made that our next stop. We found a room just up on the hill above the beach. 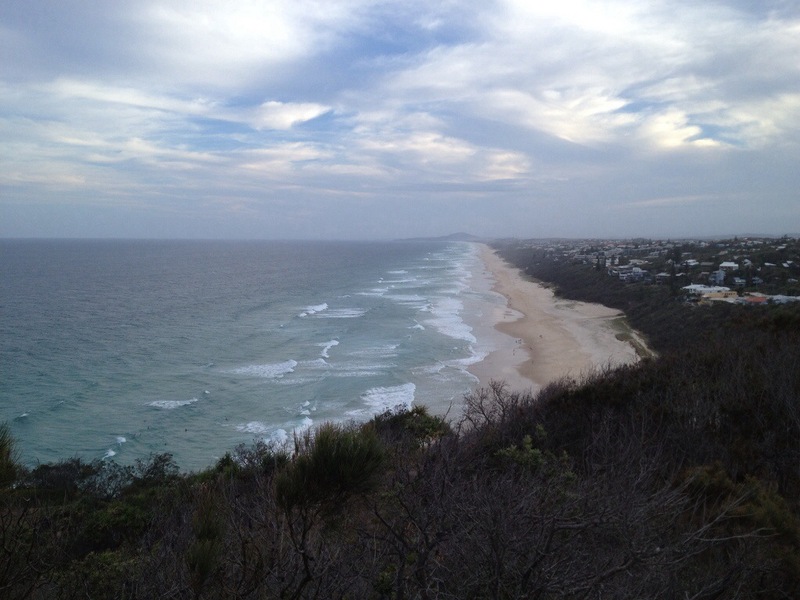 (Actually, one of my big surprises of the trip was how hilly the Australian coastline is. 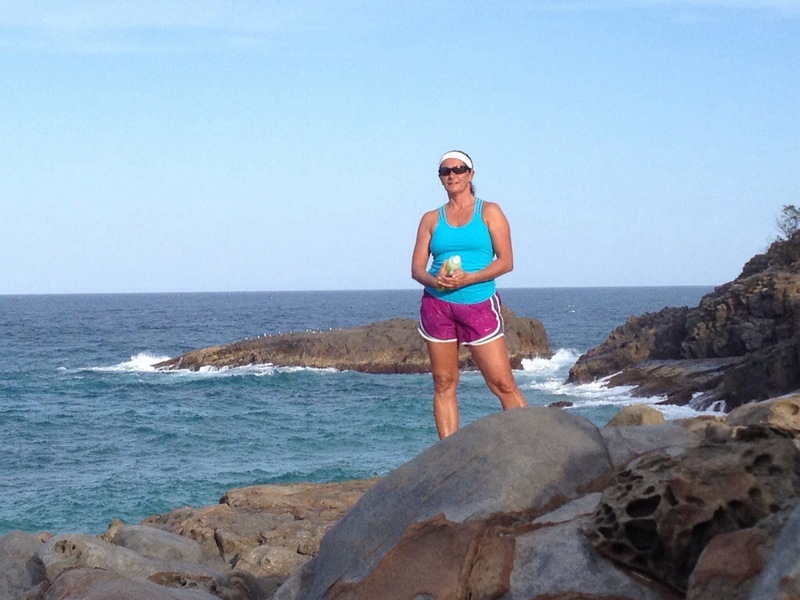 The beaches are each nestled between rugged cliffs and gnarly points of land.). 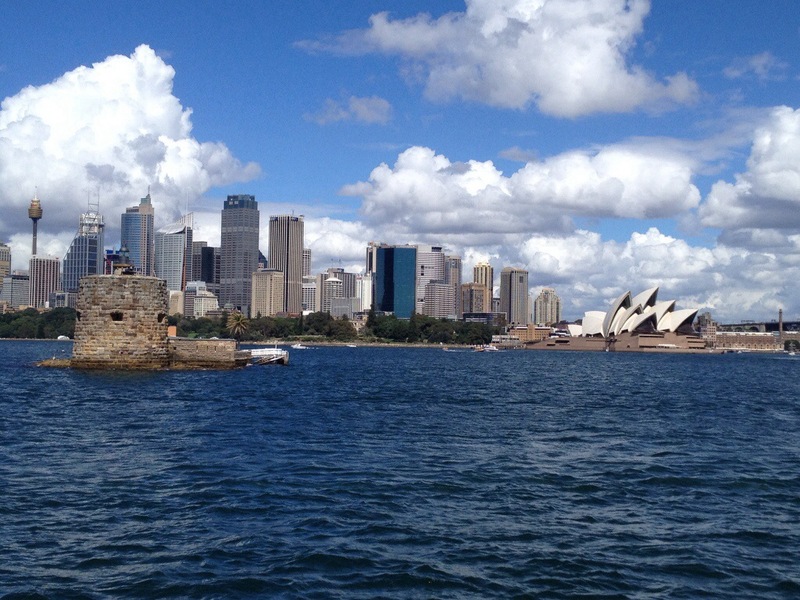 The town was way out on one of the northern fingers of the Sydney Harbour. 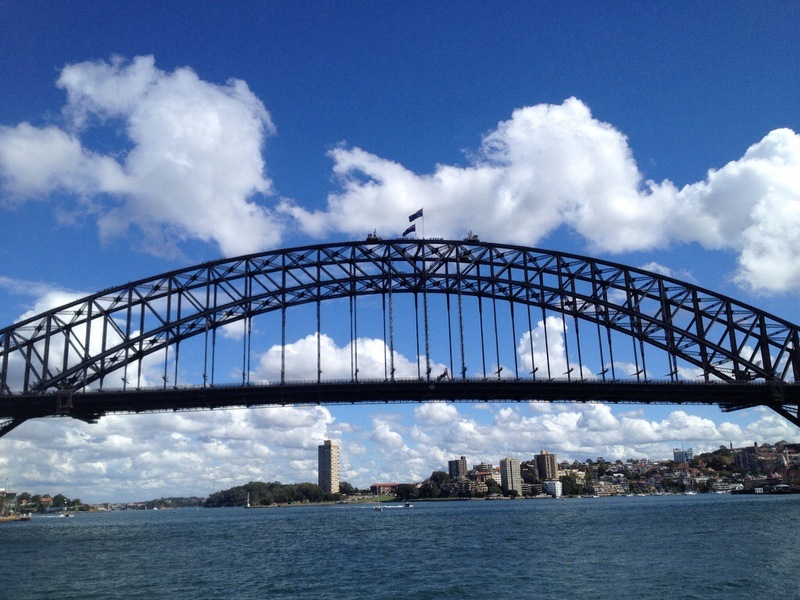 We could walk from the ocean beach, through the cool town to the harbour ferry in 10 minutes. 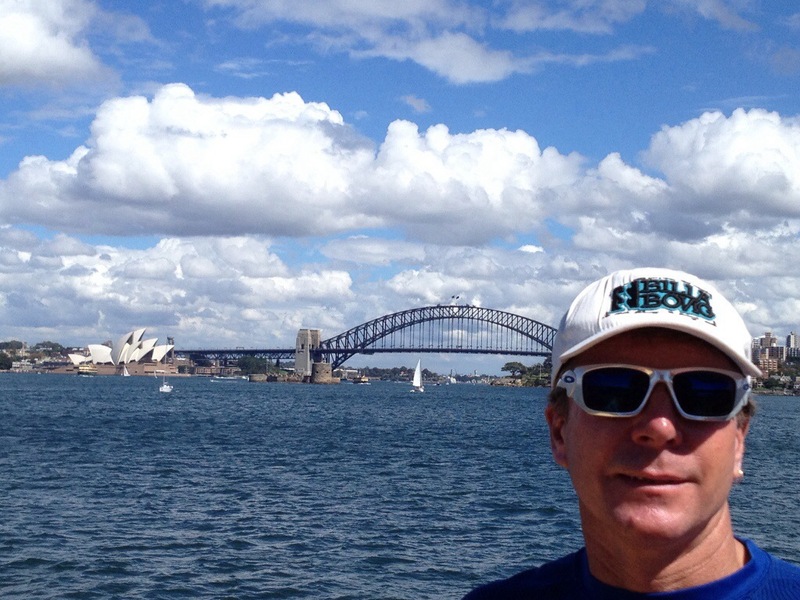 The surf was really small here, so after a short morning session, we took the ferry over to Sydney. 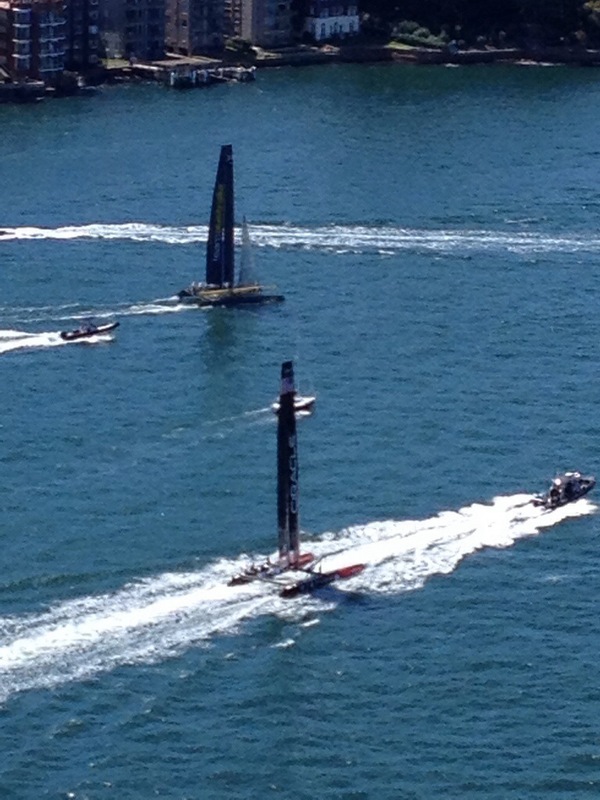 It was so much faster than trying to drive. 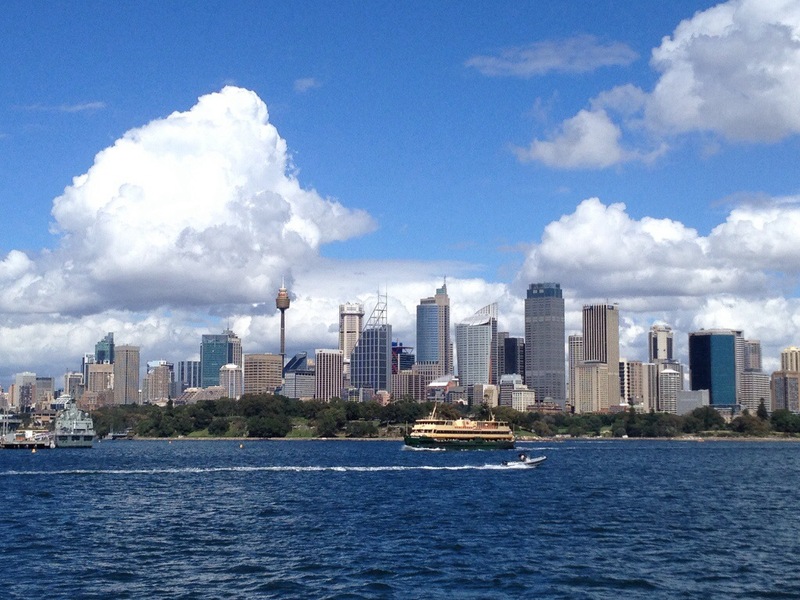 There is no fast way to drive around the Sydney area. Even the main highway goes right through the city with lots of stop lights. 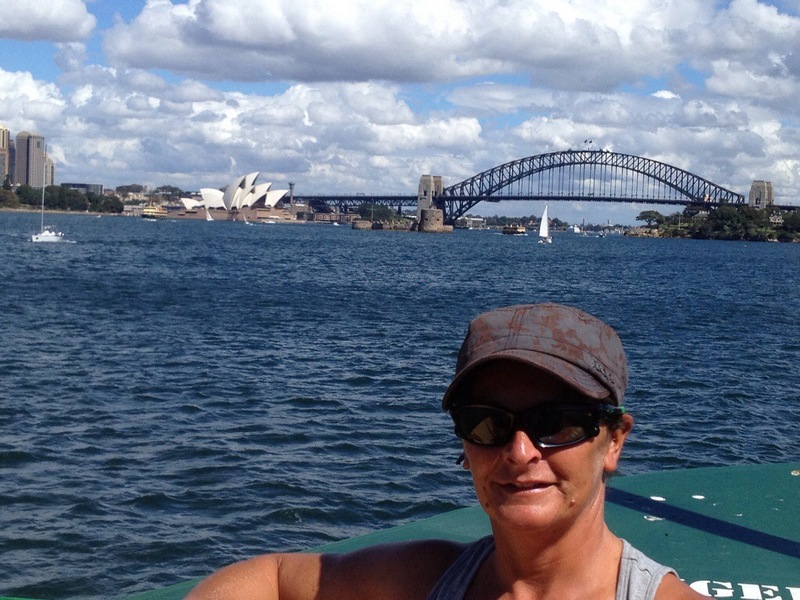 It was pretty cool to cruise around the corner and see the Opera House and the Sydney Harbour Bridge right in from of us. 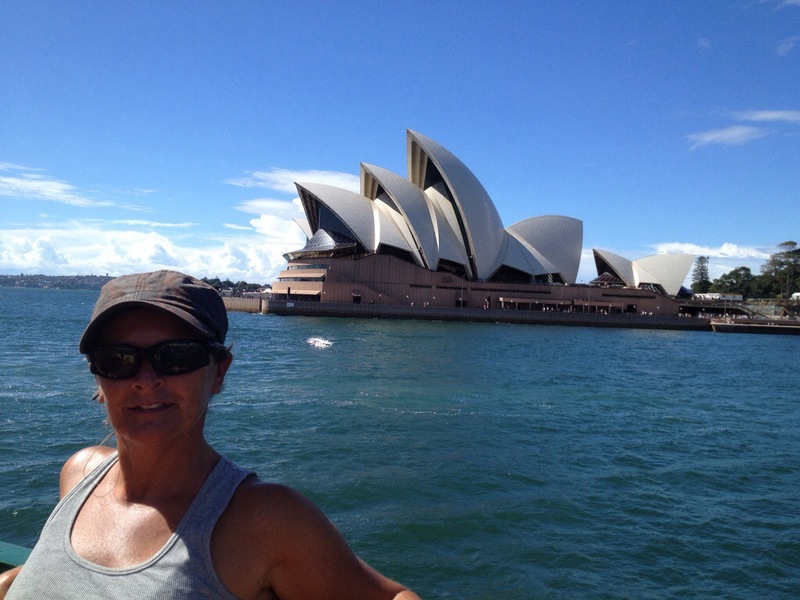 The ferry dropped us off right by the opera house and the bridge. 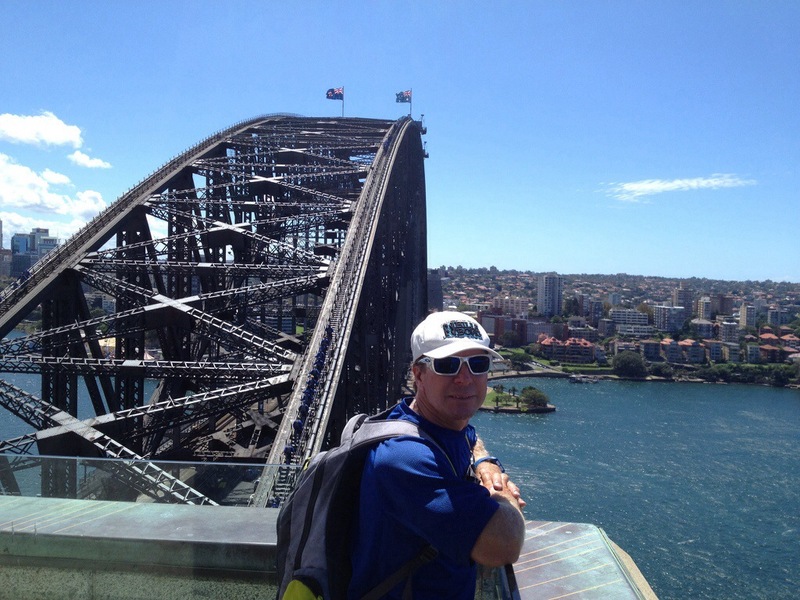 We spent some time walking around The Rocks and then worked our way over towards the bridge. 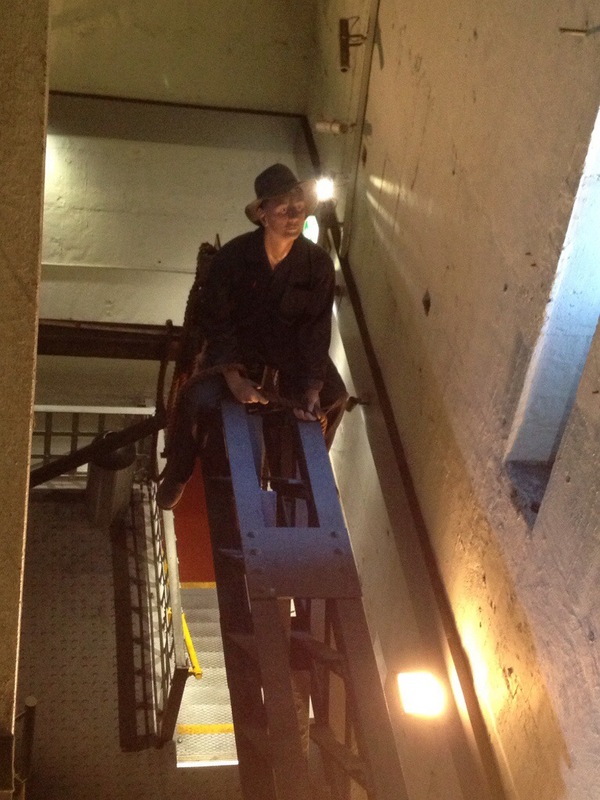 We decided to climb the bridge tower which was almost as tall as the top of the bridge. 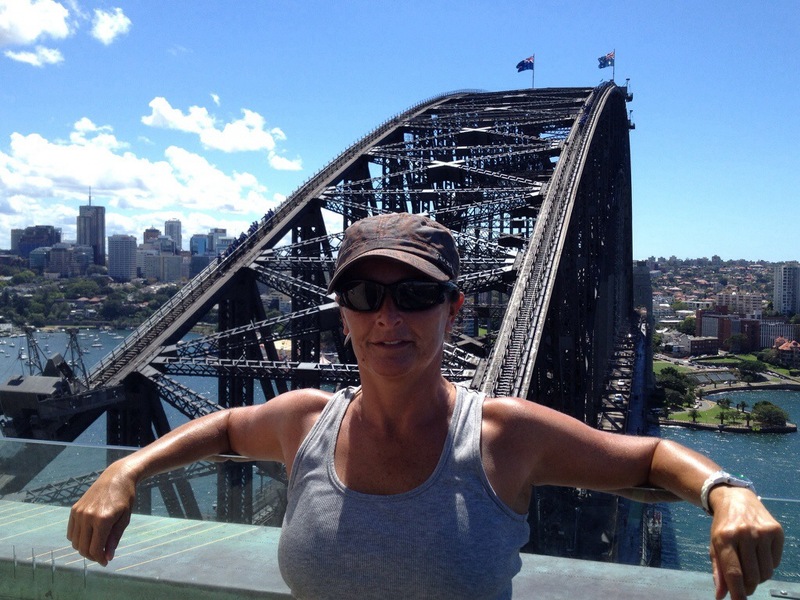 We were interested in the bridge climb, but it was ridiculously expensive. Pretty terrific views from up top. 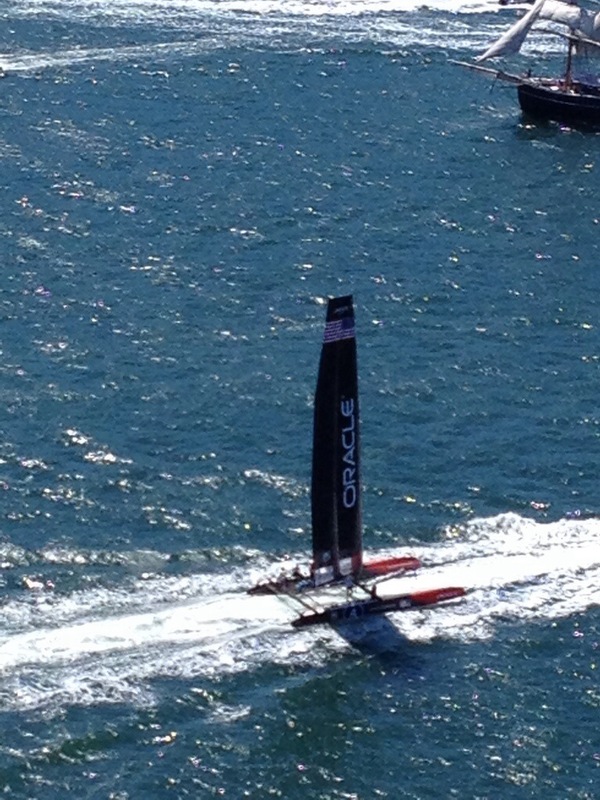 We even saw Oracle and their Aussie counterparts out training on the harbour. The displays in the tower did an excellent job of explains and depicting the building of the bridge. Such an incredible feat! 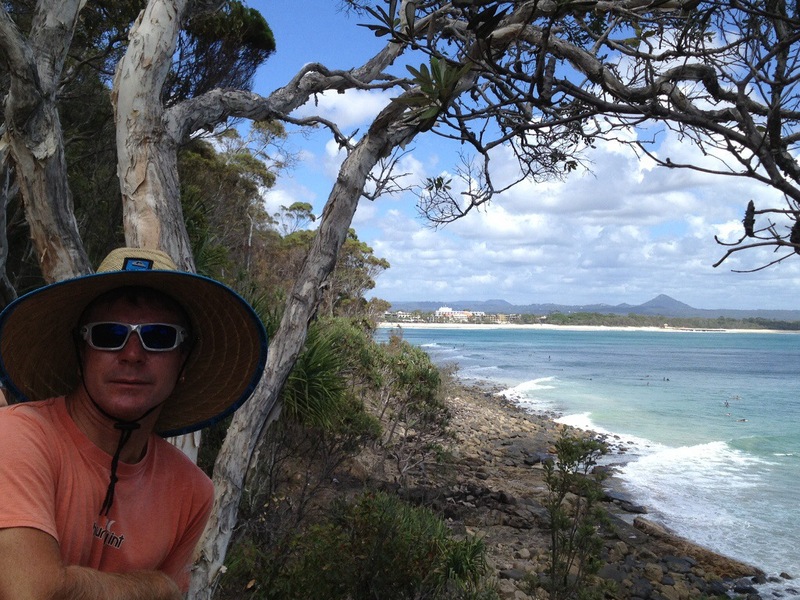 The next stop…Port Macquarie, where once again, the winds were too strong for surfing. We enjoyed some runs and walks along the beach, but only stayed for one night. 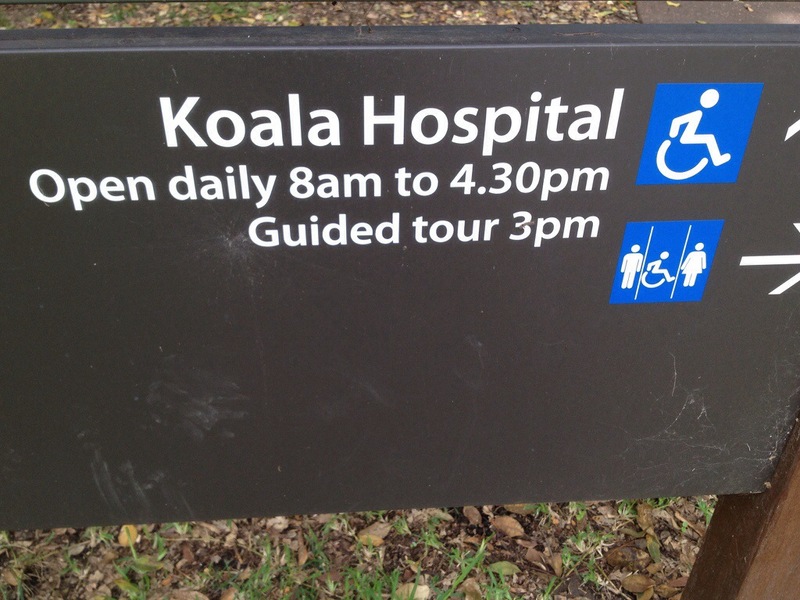 We did stop at the Koala Hospital just a few blocks from the hotel. Sooooo may sad stories there.We didn’t see the sickest koalas as they were inside in rooms, but there were numerous displays telling about the plight of the koalas. Hundreds are killed and burned in bush fires as they climb the trees during a fire and suffocate. 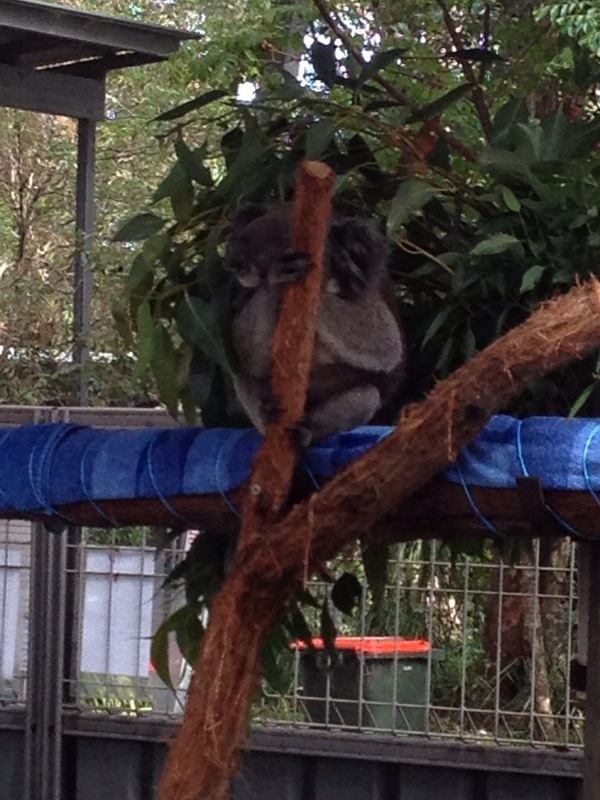 Several of the koalas here had been burn victims and nursed back to health, then released back into the wild. 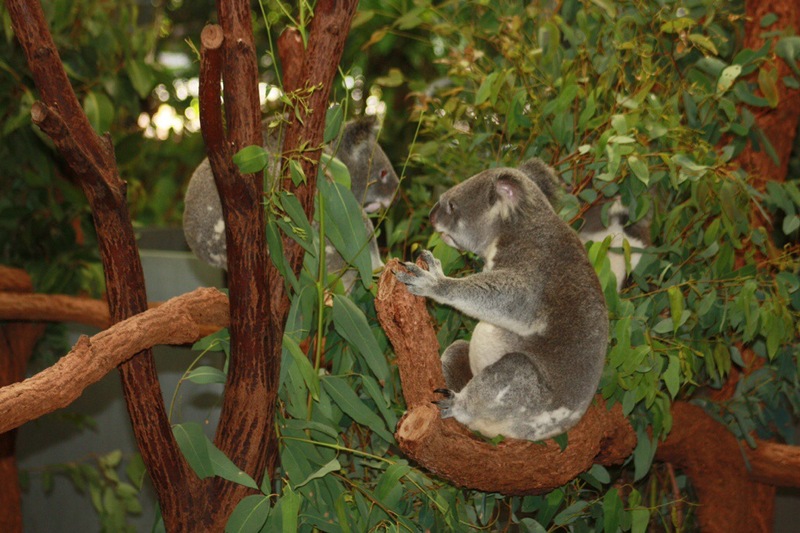 Some of them had too much damage to their paws, so they weren’t efficient climbers anymore, and now were full time residents of the koala hospital. 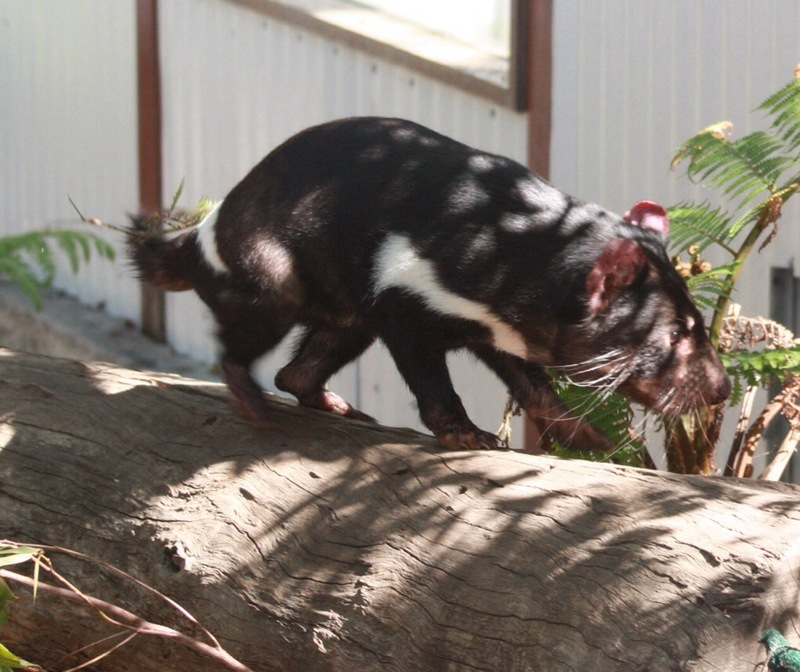 They live outdoors in a pen with a live tree in the centre for them to climb and specially built for them to climb around. Many others had been hit by cars or attacked by dogs. More terrible stories. 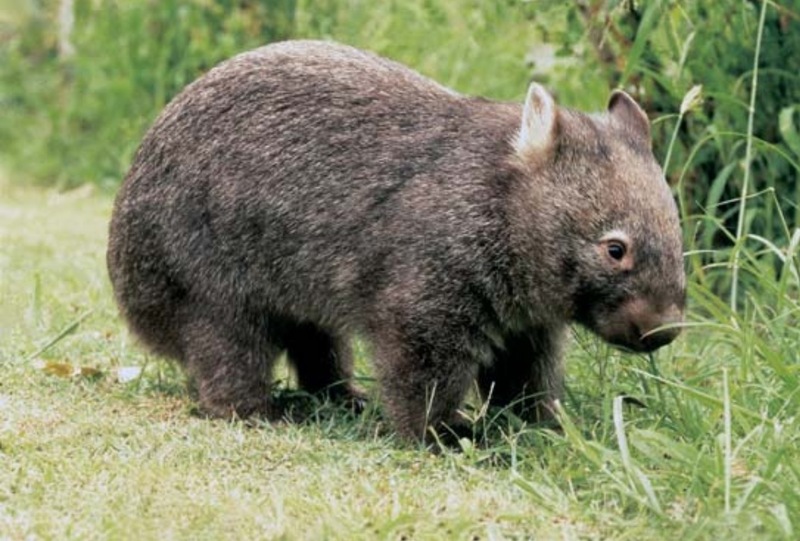 The goal is to release them back to the wild. Sadly, some of these little guys have been patients 3 or 4 times. 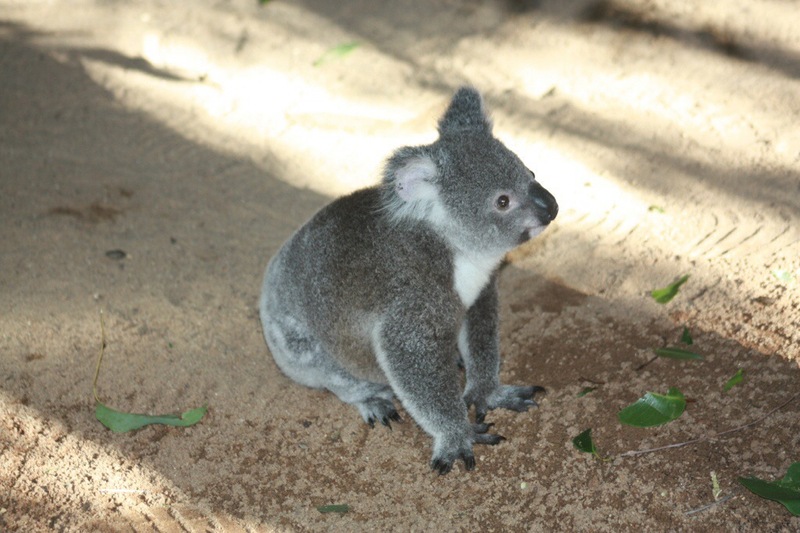 You can actually adopt one to help support the koala hospital. 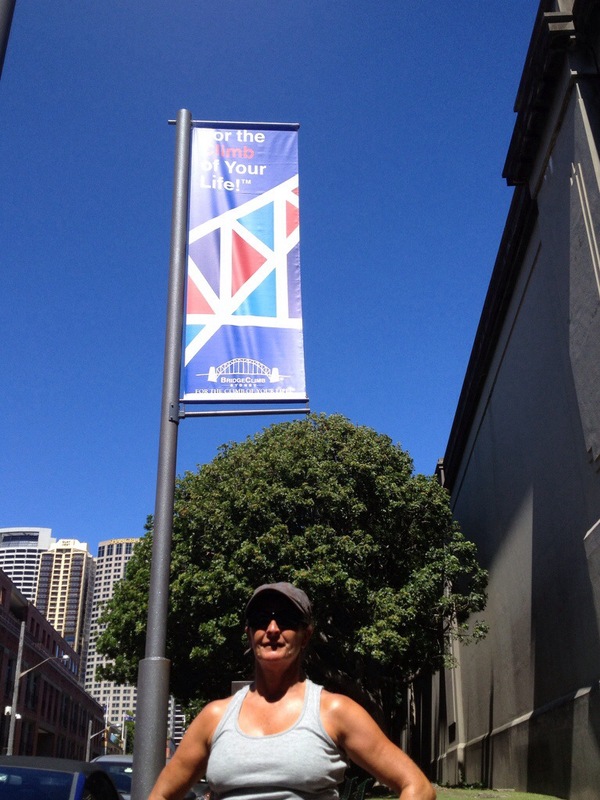 I took a brochure and think this will be a project when I return to work next September……. From there, we headed down to Newcastle to meet up with one of Dan’s former students, turned co-worker. The place we were staying was only a block from them. Go figure! 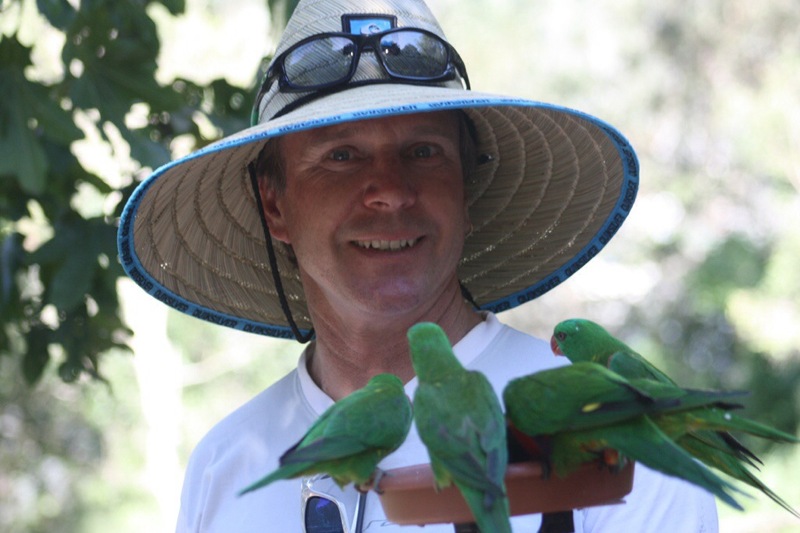 Chris Cividino taught at Parkside for a couple of years, but returned to Australia to teach. 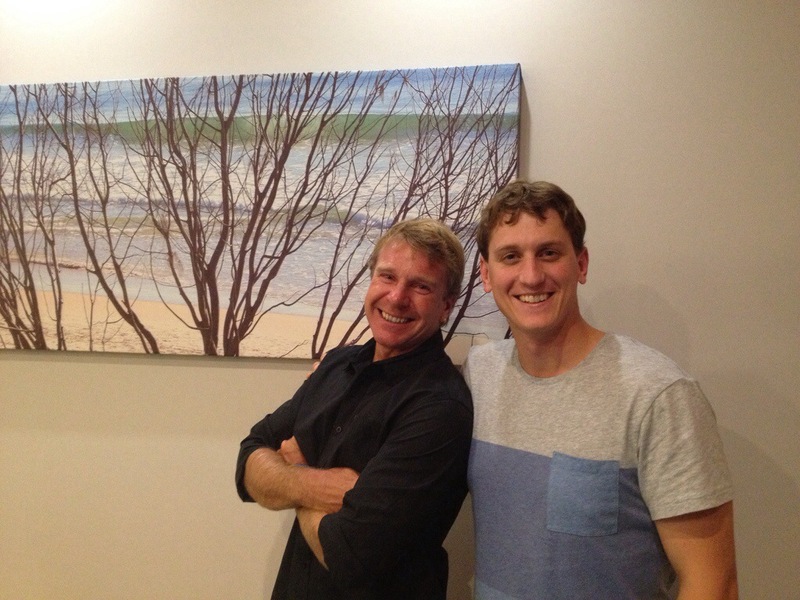 He and his fiancé and her family, had us over for a delicious Australian dinner. What a treat to have an amazing home cooked meal by Angie, Frank and their family! 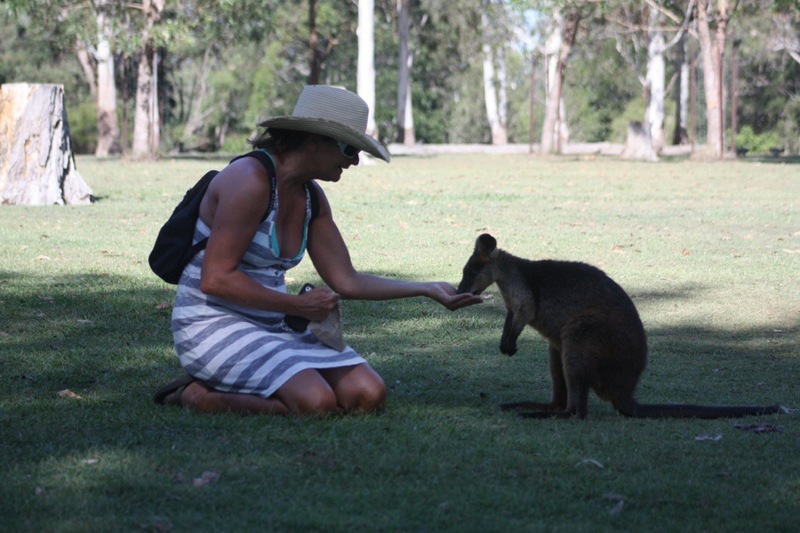 We were treated to lamb shanks as well as a fabulous homemade pavlova for dessert….an Aussie speciality! It also happened to be opening night for the Asutralian rugby League so Frank and Chris gave us the scoop on th top players and even tried to shed some light on this whole ‘cricket’ thing, but honestly, were still completely lost when it comes to cricket! 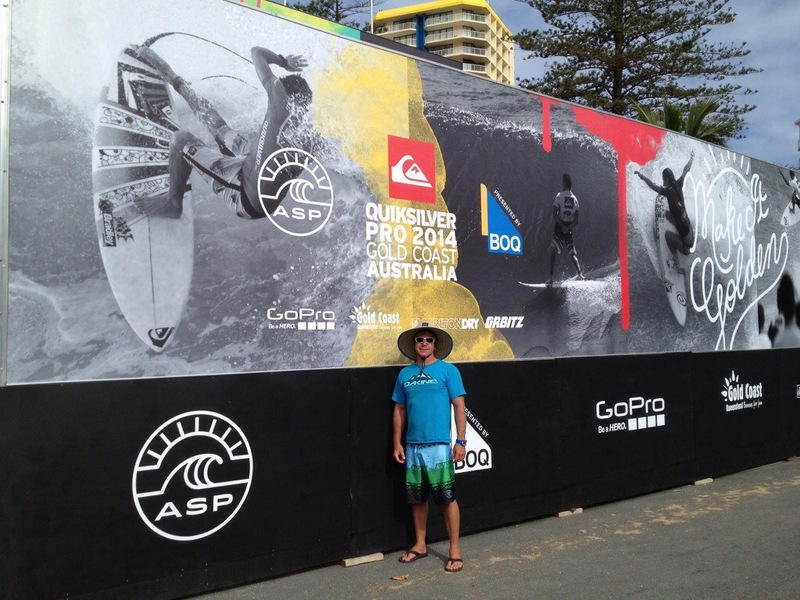 Dan surfed some great waves the next morning at Merewether Beach. 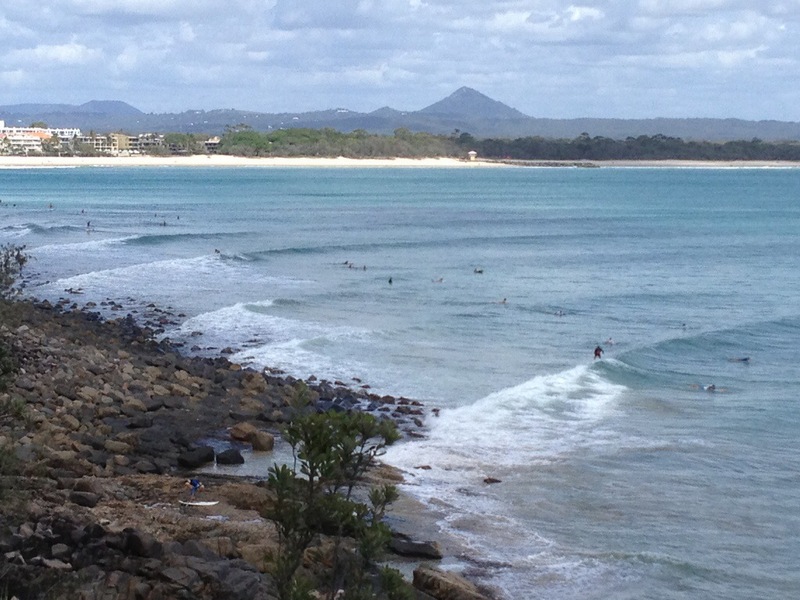 They were much bigger than the longboard waves we experienced at Noosa and Byron Bay. So much fun, but the temperature was definitely colder here than up north. Lots of wetsuits in the line up now, instead of the cotton t shirts to keep us cool and prevent sunburn. 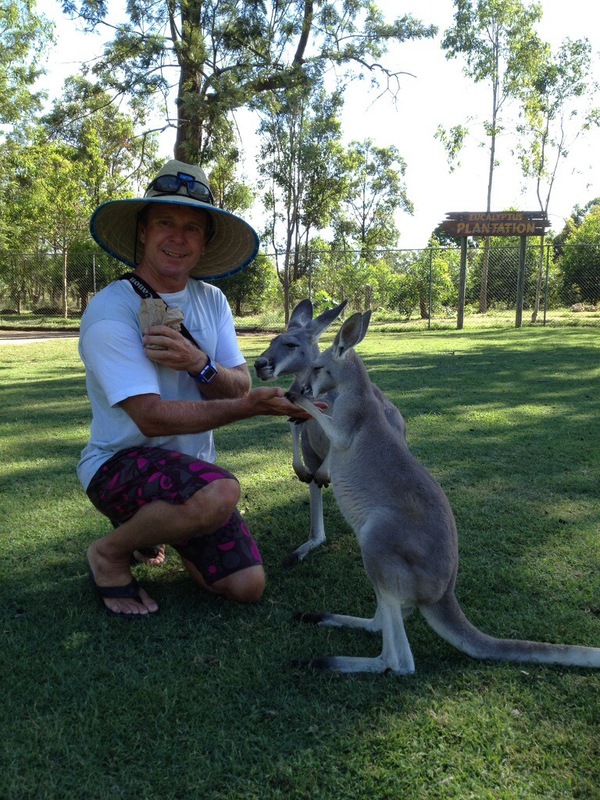 Byron Bay….surfing, hippies and thieves! 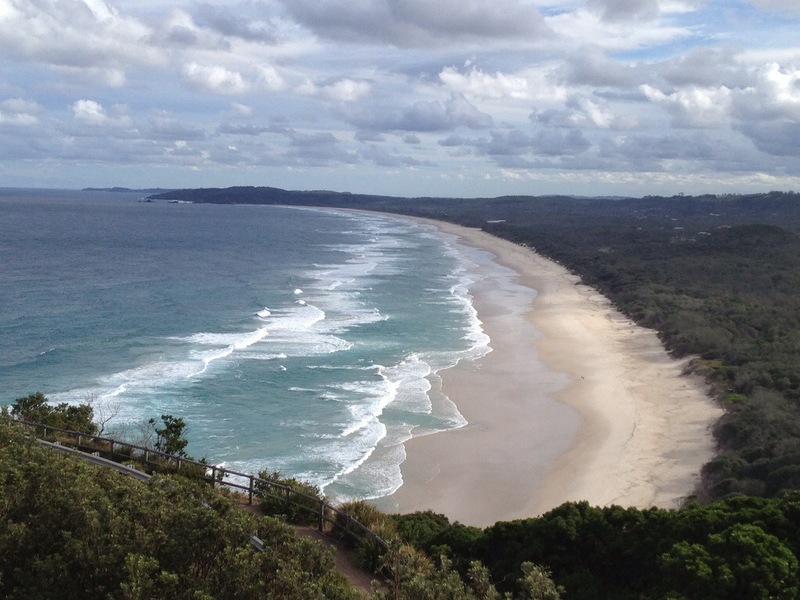 Byron Bay is also the furthest point east in Australia. 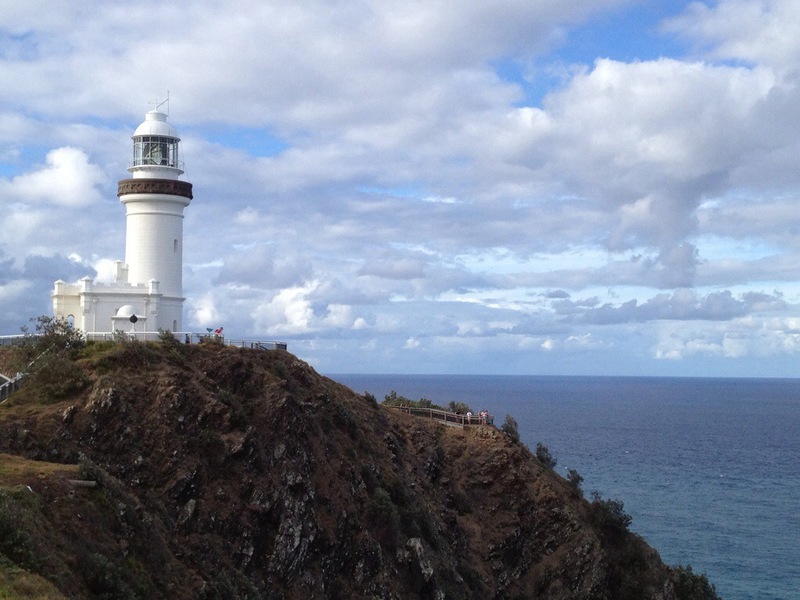 We took a drive up to the lighthouse to check this out and enjoy the views from this cool spot. 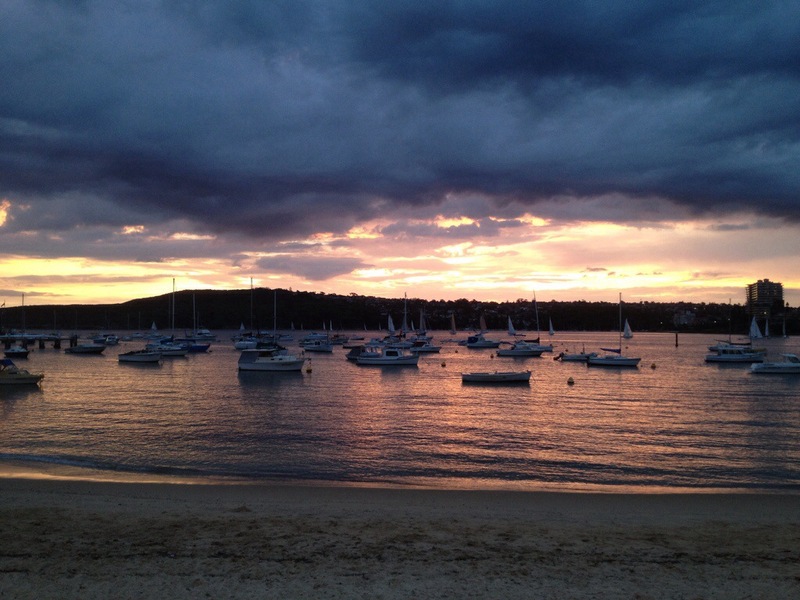 Unfortunately it was here that we experienced the darker side of Aussie beach life. Some jerk broke into the car and stole the cash from both wallets. Luckily they were kind enough to leave the credit cards, iPhone and Oakleys behind. Guess it could have been much worse! But it left a sour taste in our mouths for Byron until we had a great early surf session the following morning before we headed out of town. Token Alanna Blanchard shower shot for the men! 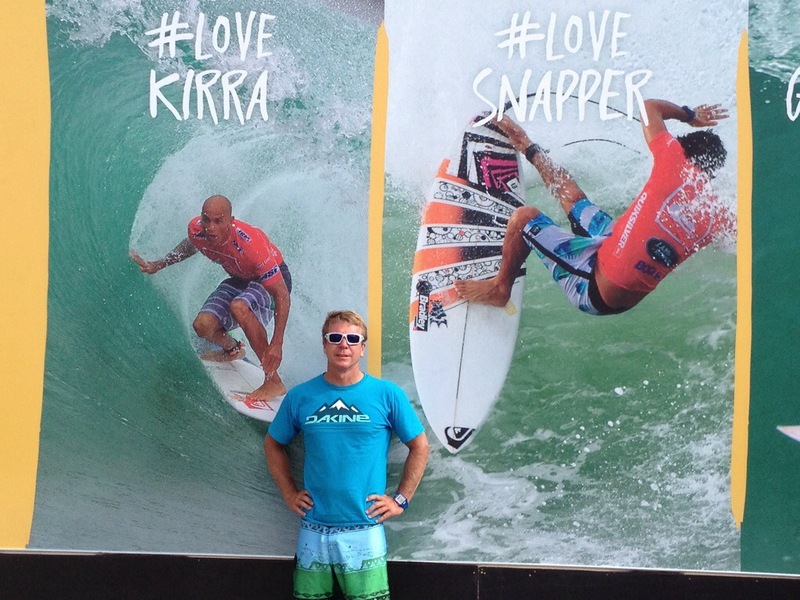 The following day we returned to Snapper Rocks to watch the men. The beach was jammed. 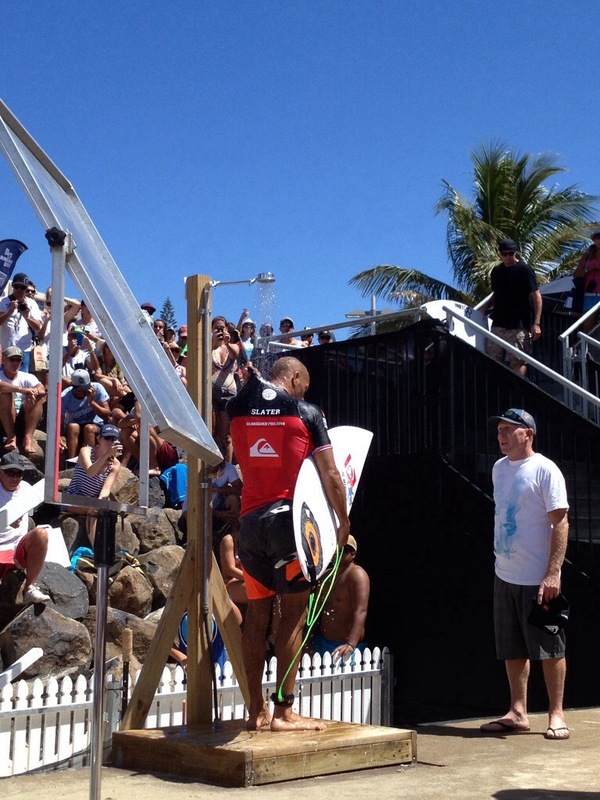 Everyone was hoping for their Kelly Slater sighting or autograph! Roz managed to get her shower shot, so we were even! It was a pretty incredible atmosphere and a few days that we will most definitely remember! Feeling pretty privileged to have seen these amazing athletes performing at such a high level. 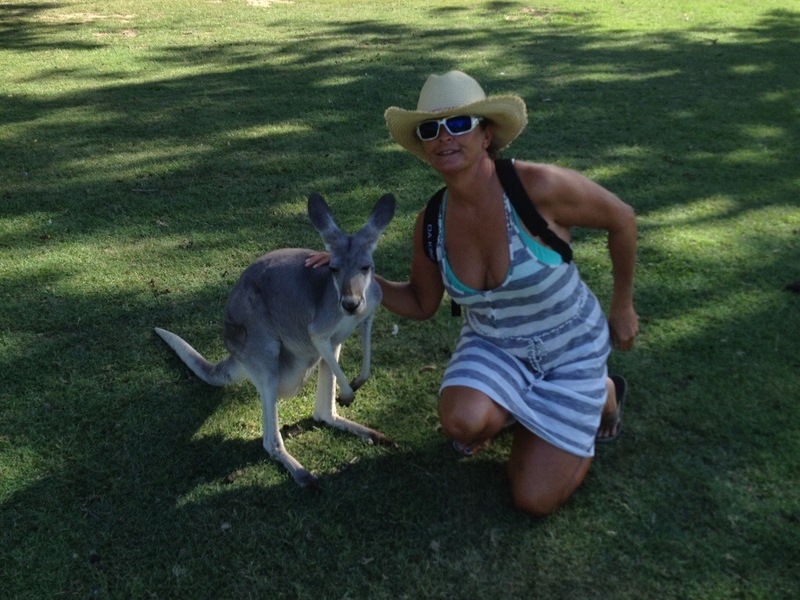 So here we are in Punta De Mita, Mexico….a month out of Australia! 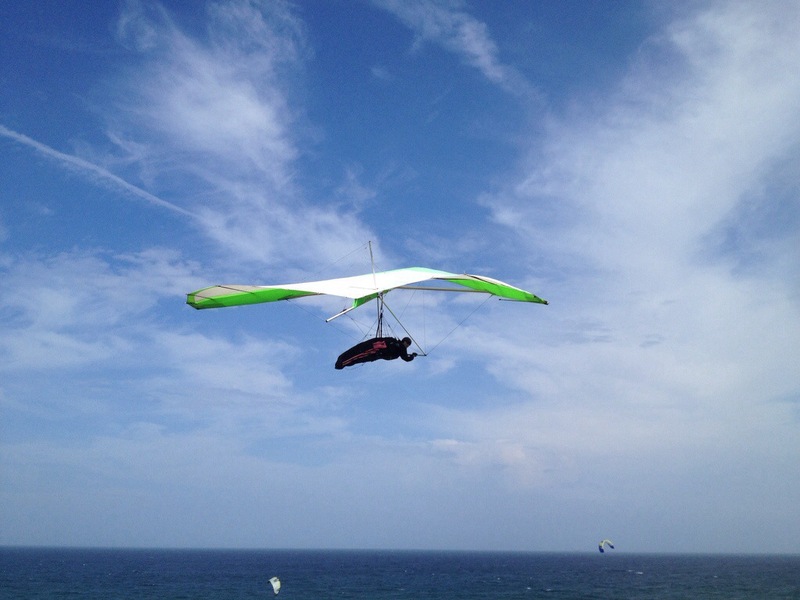 No waves here right now so finally going to post wha we had written, but no time to format. 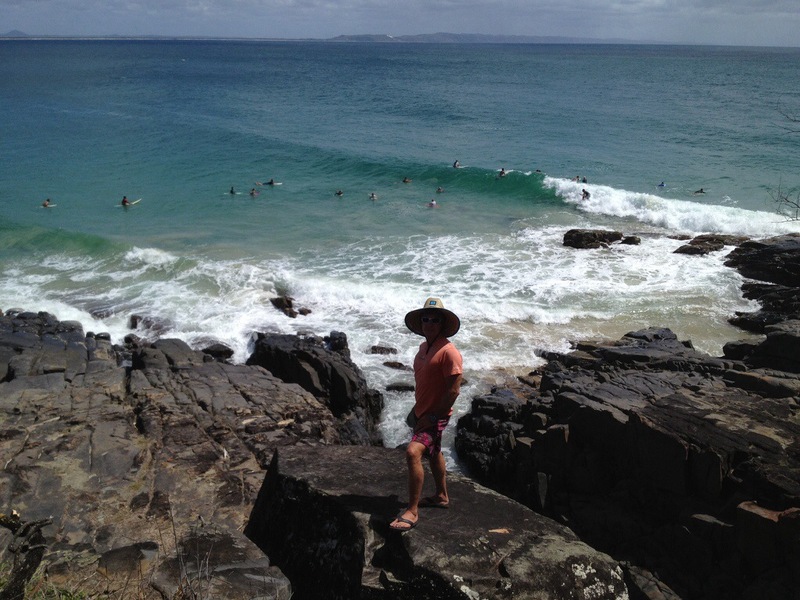 Kirra, Burleigh, Greenmount, Currumbin Alley, D’Bah, and Snapper Rocks…..all super popular surf breaks we had been excited to surf/or watch the pros surf! 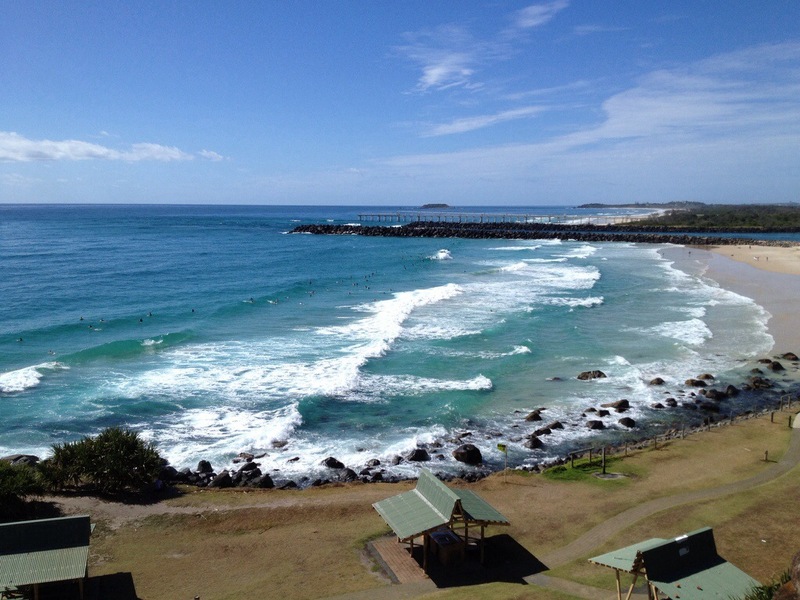 We stayed right by Currumbin Alley and did most of our surfing there. 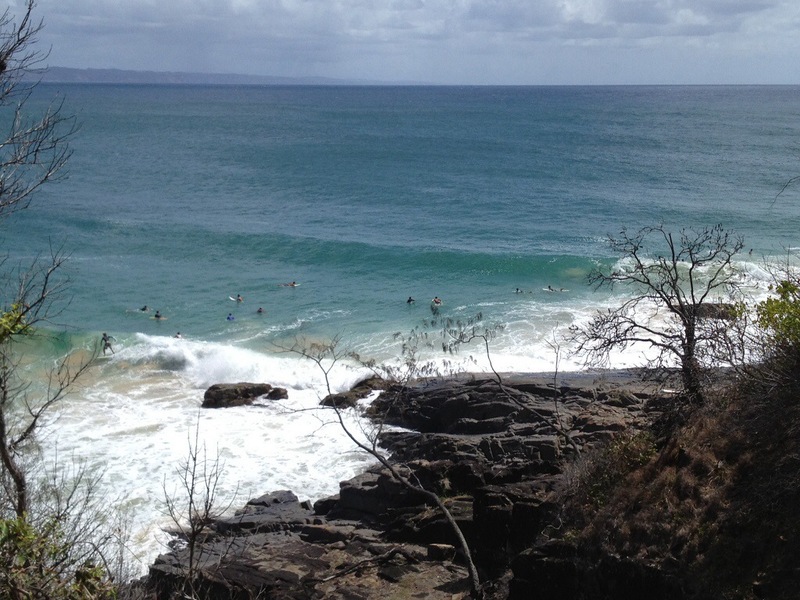 That was another nice point break, so it was very crowded. It also had some serious current, depending on the tide, as it was right as the river mouth. 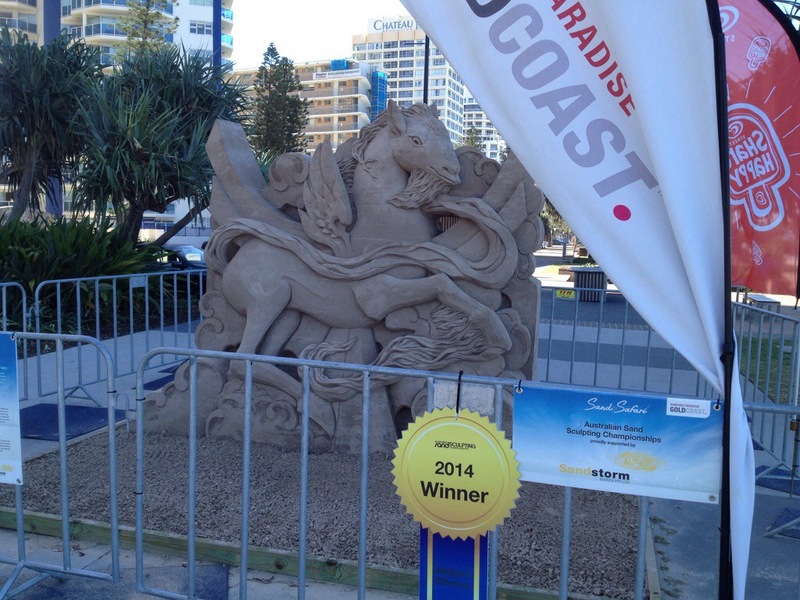 We tried out World Famous Kirra, but it is broken. 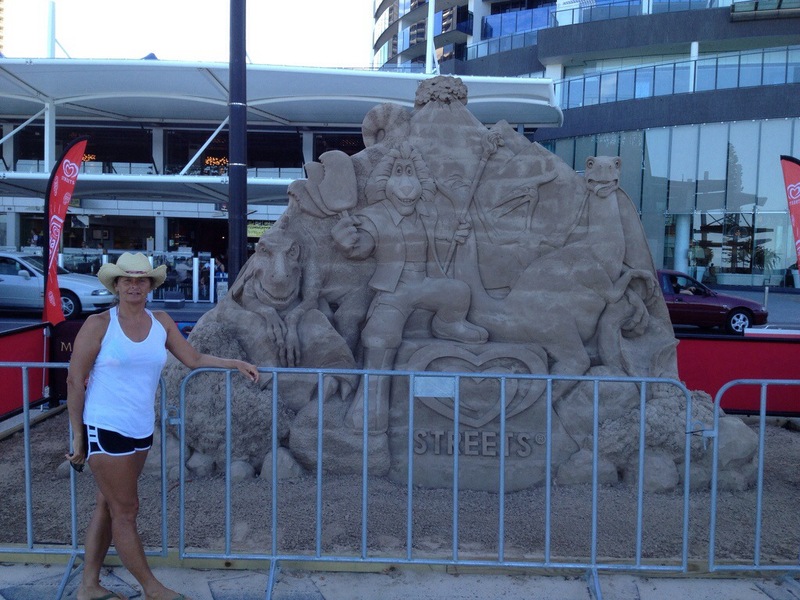 The sand dredging that has made the Super bank has changed the waves there. There wasn’t much of a wave there for us. 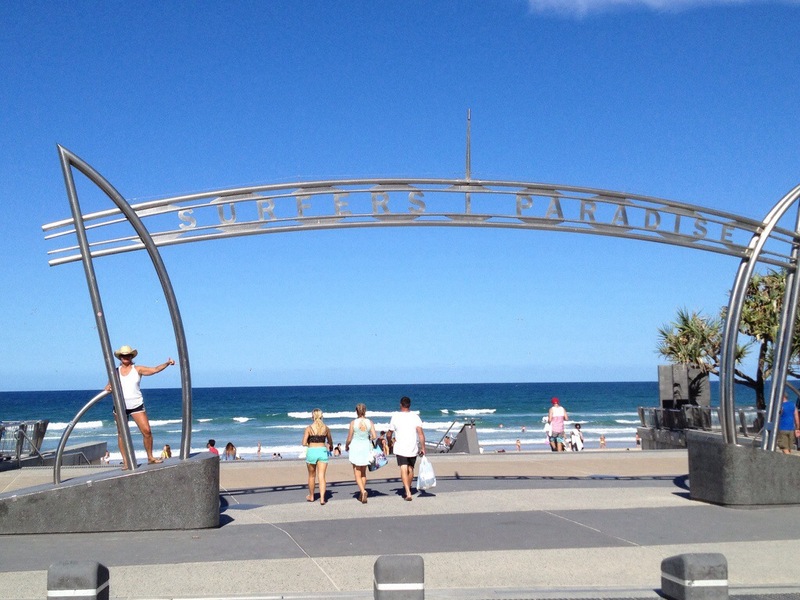 We checked out Surfers Paradise one afternoon. 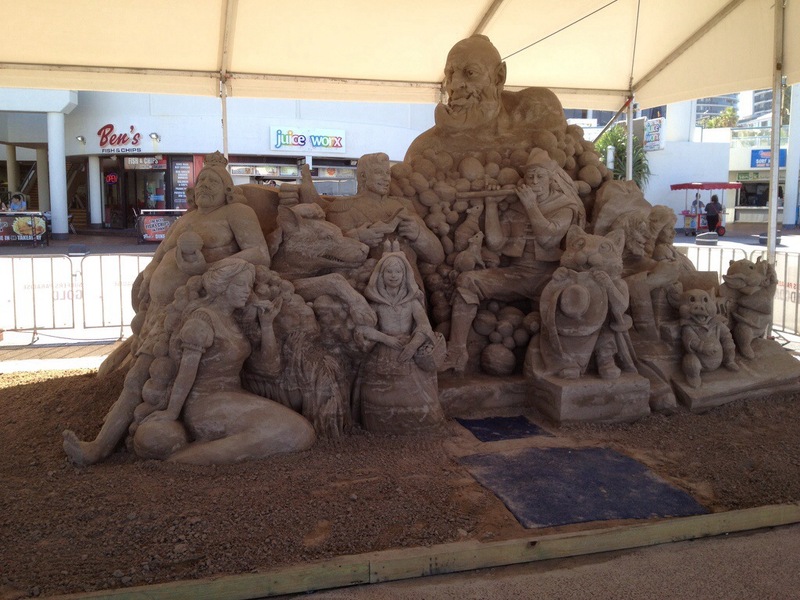 Way too windy to surf, but we checked out the scene and were amazed by the incredible sand sculptures on display for a contest. 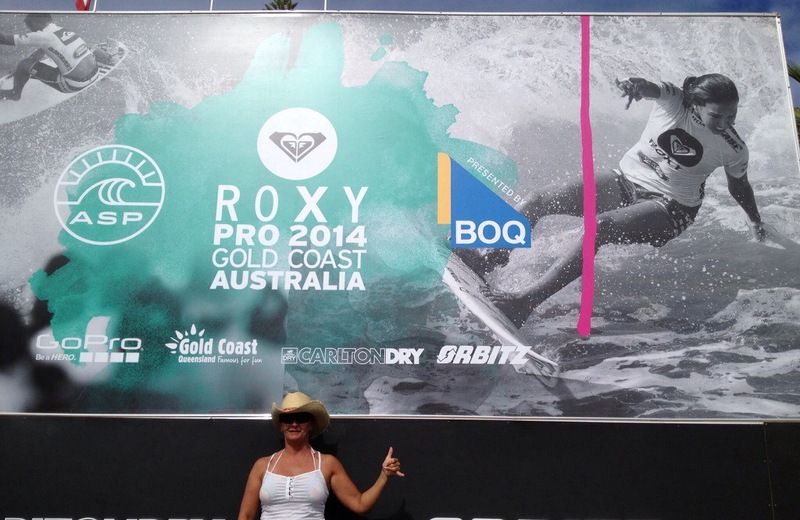 We did get to see opening day for the women and the men at the Roxy/Quiksilver Pro at Snapper Rocks. That was awesome! The waves were fairly small, but everyone was killing it. 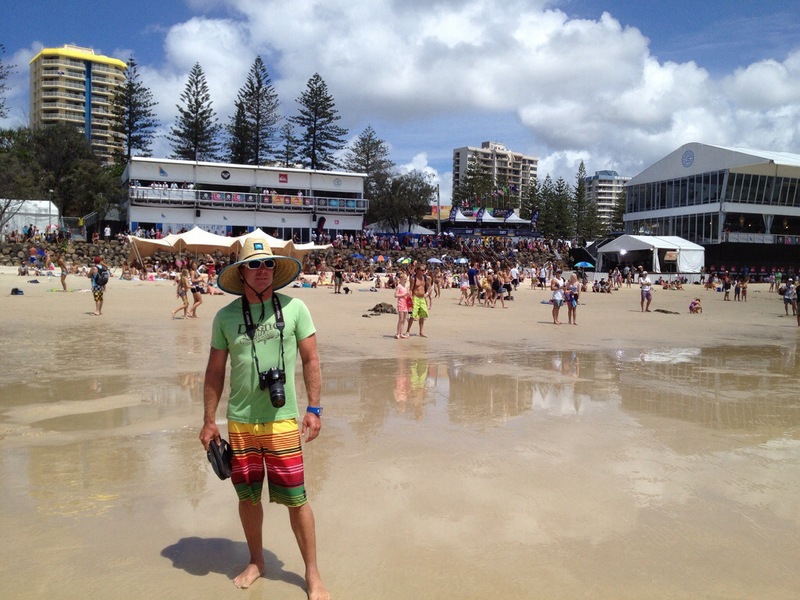 The crowds were massive, but when Kelly Slater started down the beach, it seemed to multiply by 10 again. I have never seen anything like that. So cool. He killed it on the water too. 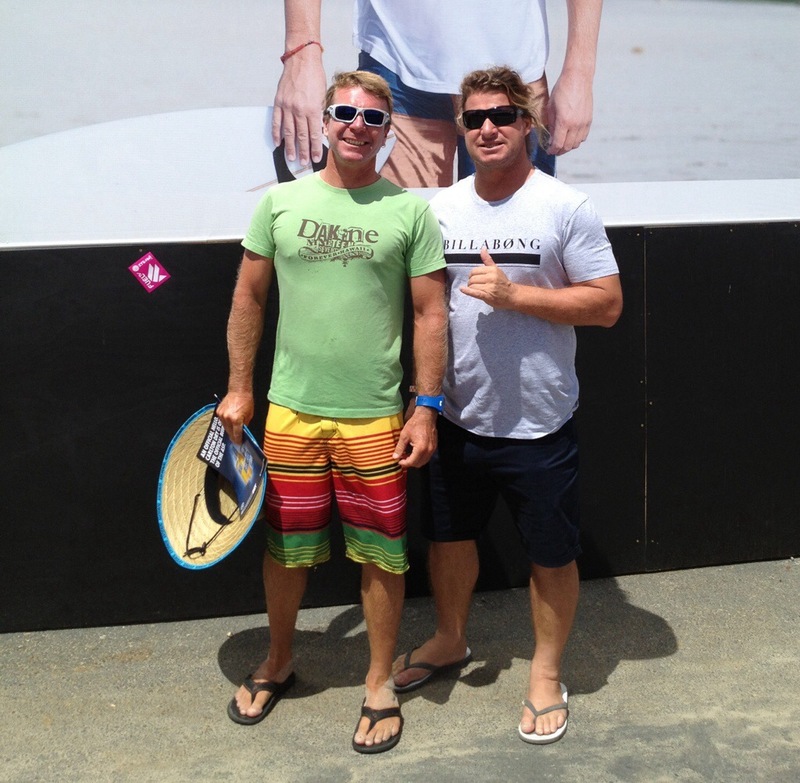 We were lucky enough to spot legendary surfer, Mark Occhilupo, in the crowd….Got to chat with him a few minute and Dan got his groupie pic taken with him! 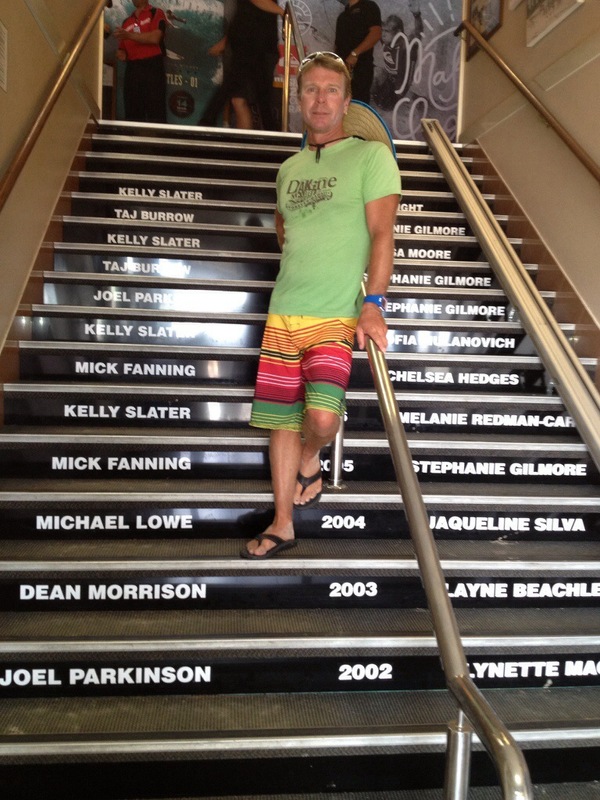 Below is the tribute to past champions of the Quiksilver Pro. 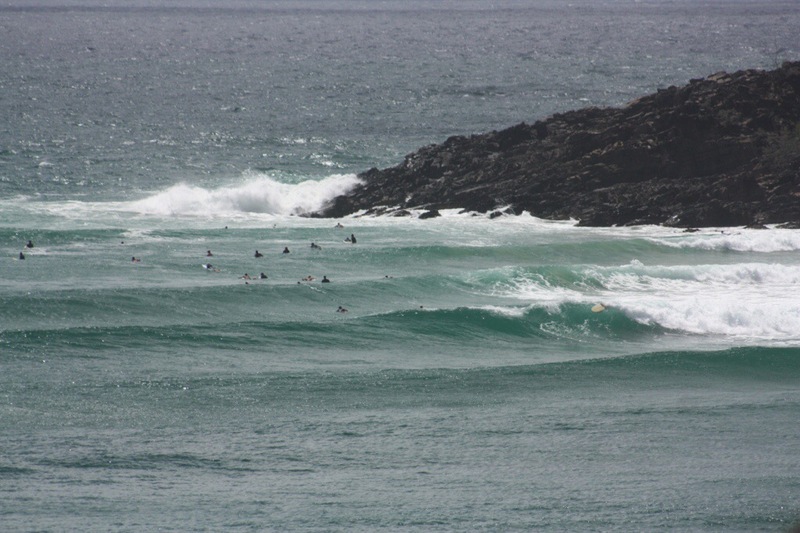 The scene at Snapper Rocks during Round 1. This was a tiny crowd compared to how massive it got over the following days. Headed out for some fresh seafood, post surf session at Lal Lancha. 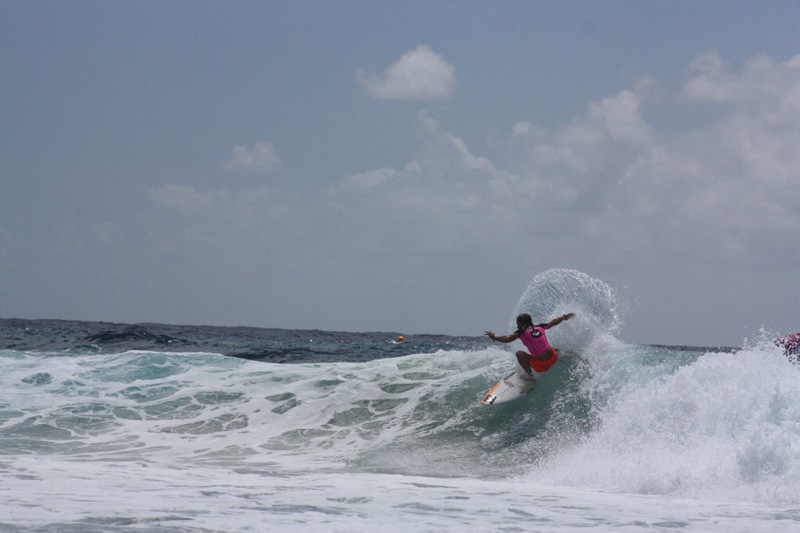 Will post the surf pix in a few hours in a separate blog. 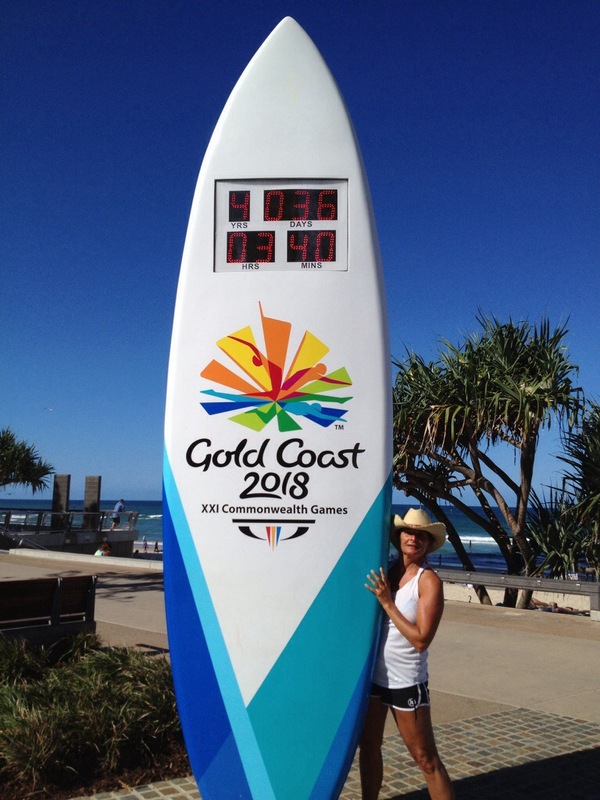 Our last morning in Sunshine Beach and we awoke bright and early to hit the water. 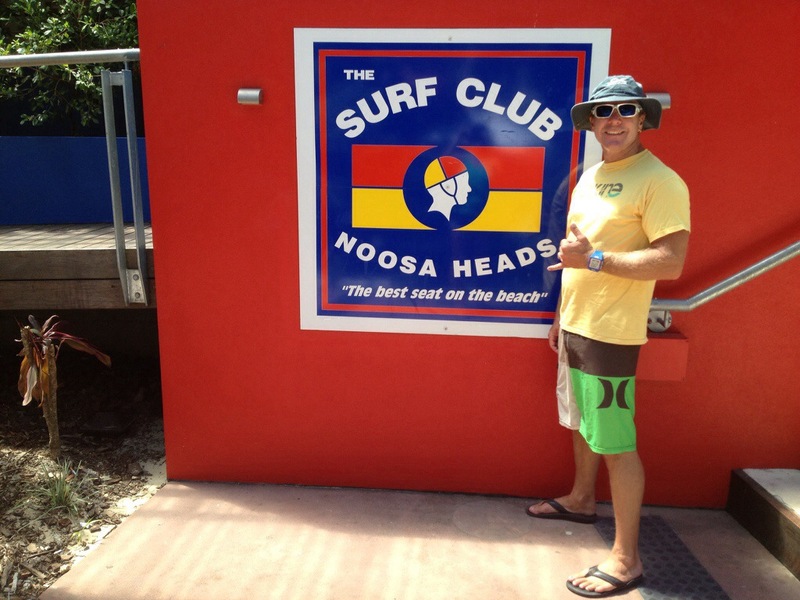 We decided to surf First Point at Noosa. There were only a few people in the lineup so we enjoyed lots of rides off the point once the tide changed. Wish we had some shots oops rides, but neither one of us wanted to leave the water to take pictures. 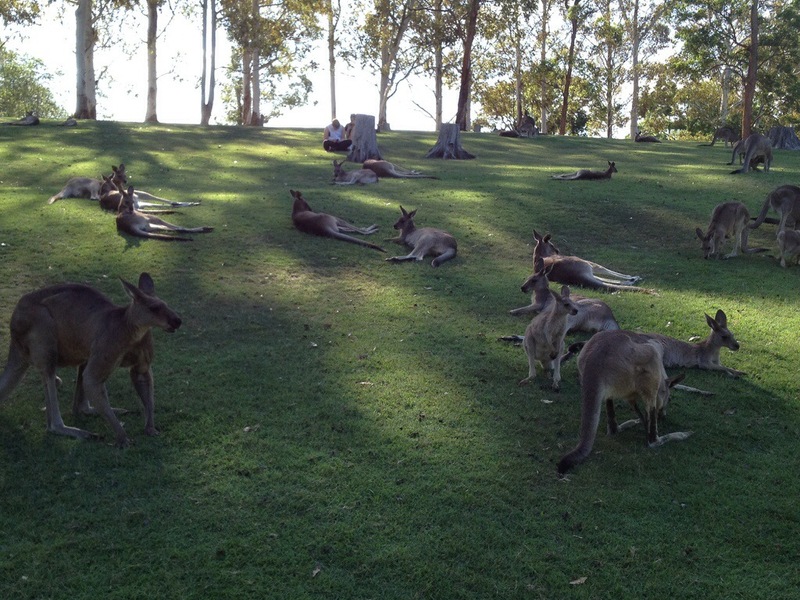 At 9am, we packed up and hit the road towards Brisbane. 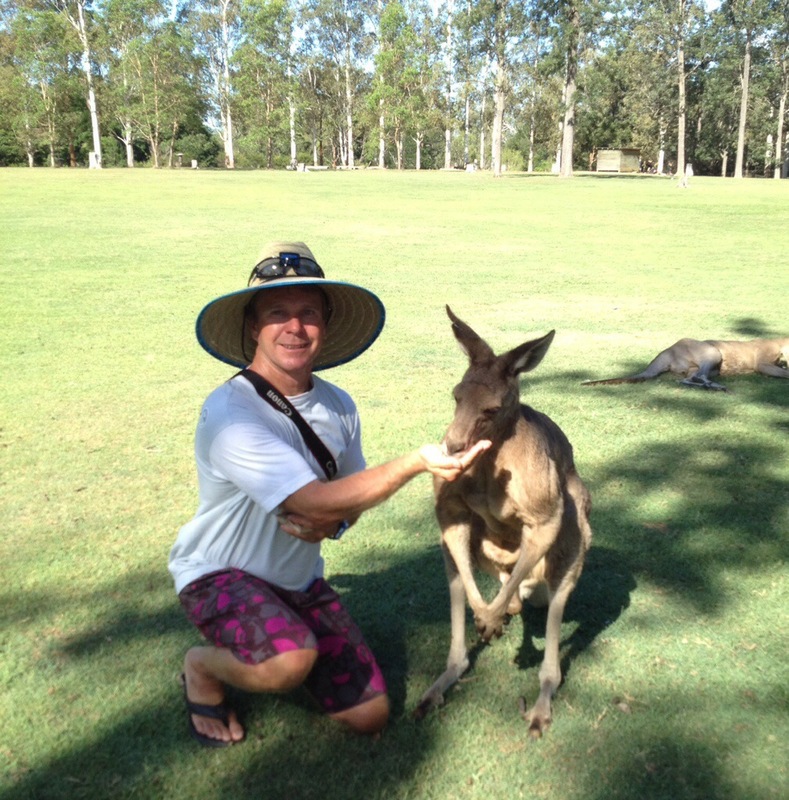 Today we were going to the Lone Pine Koala Sanctuary. 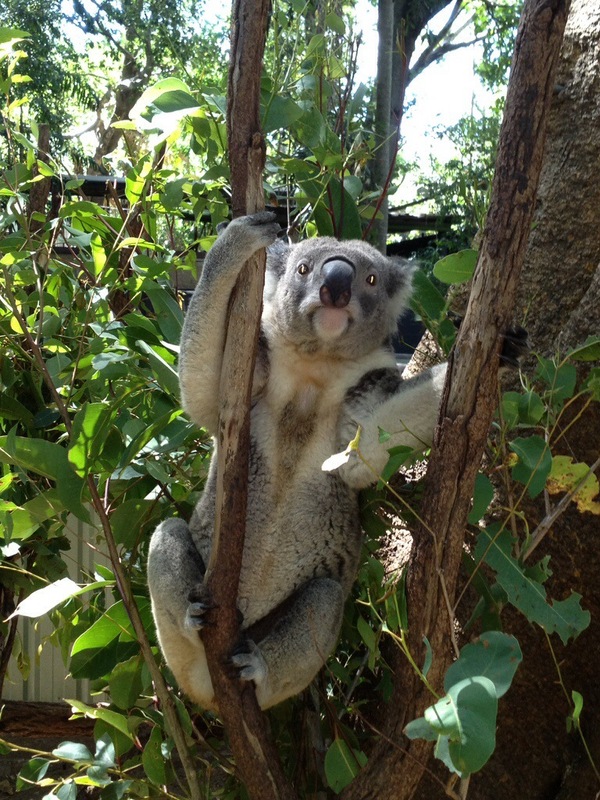 Our koala sighting this week in the park had made us even more anxious to see more of these adorable little bears. 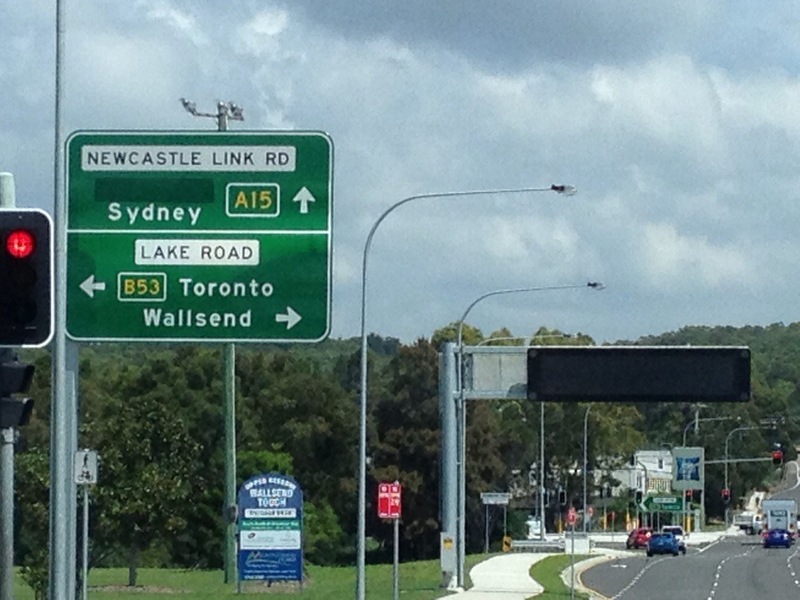 It was just over an hour to Brisbane, finding the place without getting lost. Pretty impressed with ourselves! We had to go through a tunnel below the river which was the longest we’d ever been through by a long shot! 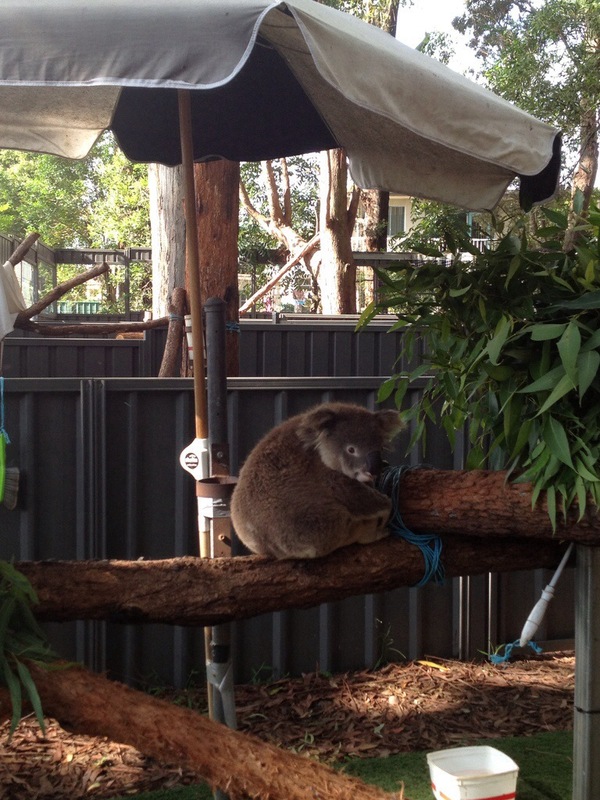 Luckily for us, the koala sanctuary crowds were non existent. I guess going midweek after all the little Aussies were back in school was a great idea. 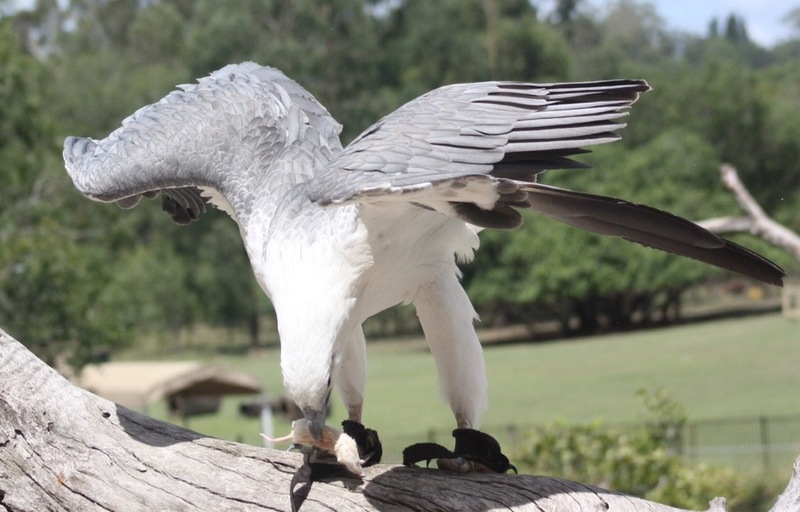 First of all we visited the birds of prey presentation. This is not like our African Lion Safari show. 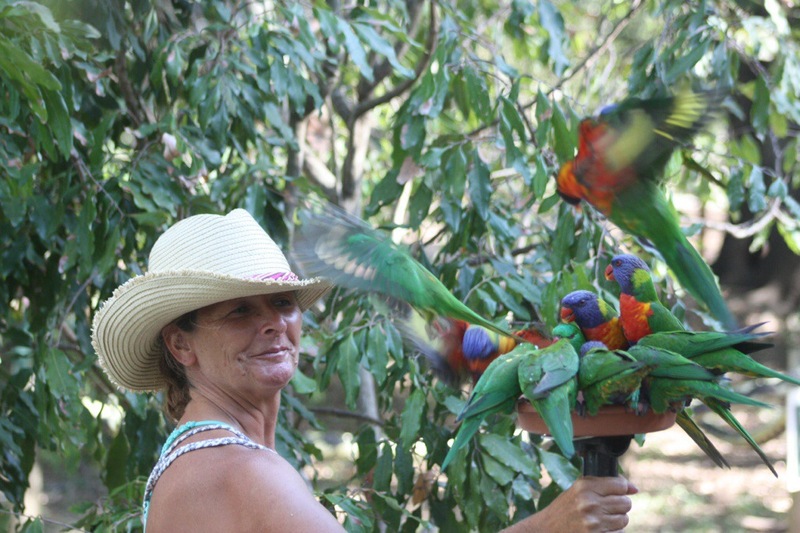 All the birds are native to Australia. 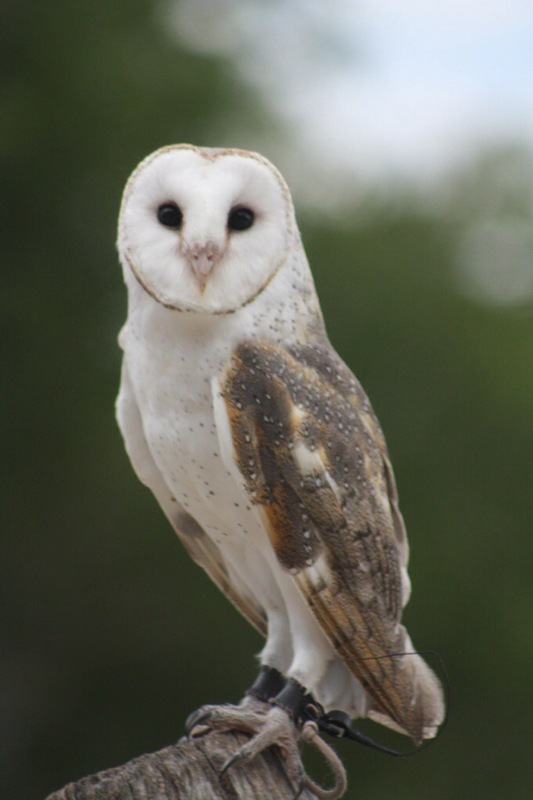 We saw the beautiful Australian Barn Owl. 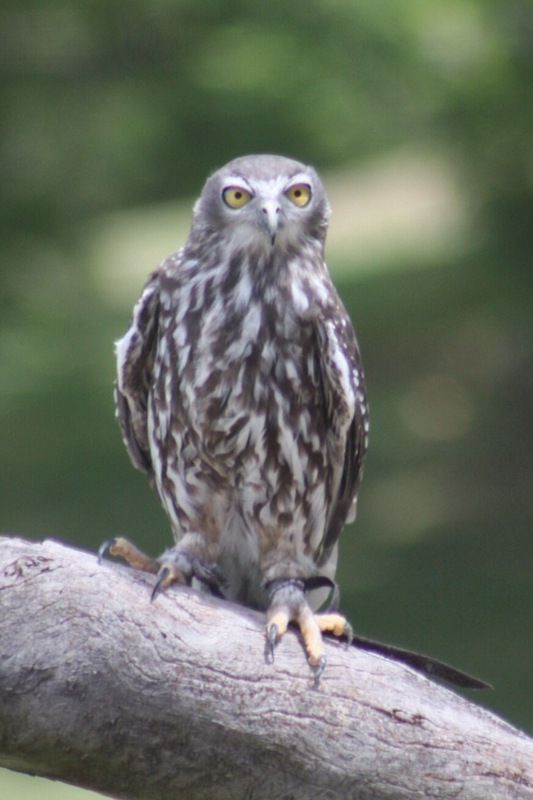 Followed by the Australian Barking Owl who enjoyed some delicious mouse head snacks just a few feet from us. Yuck! 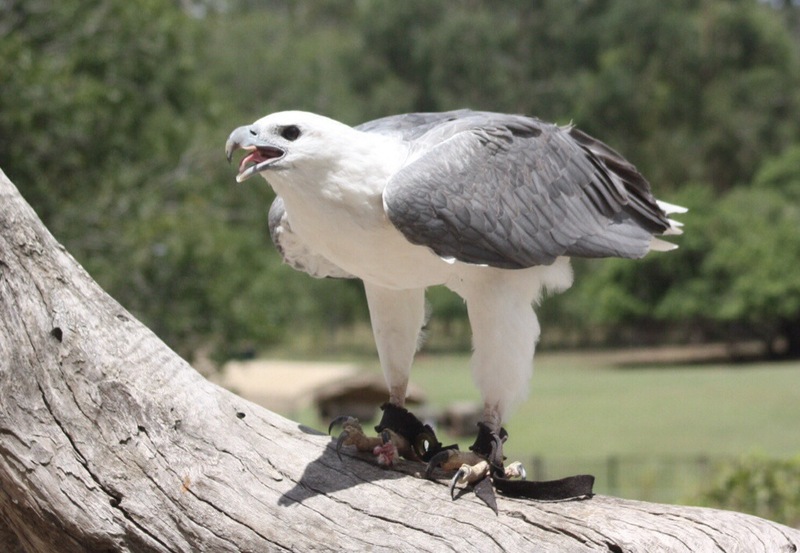 The Australian Sea Eagle was massive and had a super impressive wingspan that we weren’t able to catch on camera. Since we hadn’t had time to get to a sheep shearing show in NZ, we decided to check out the snow here. 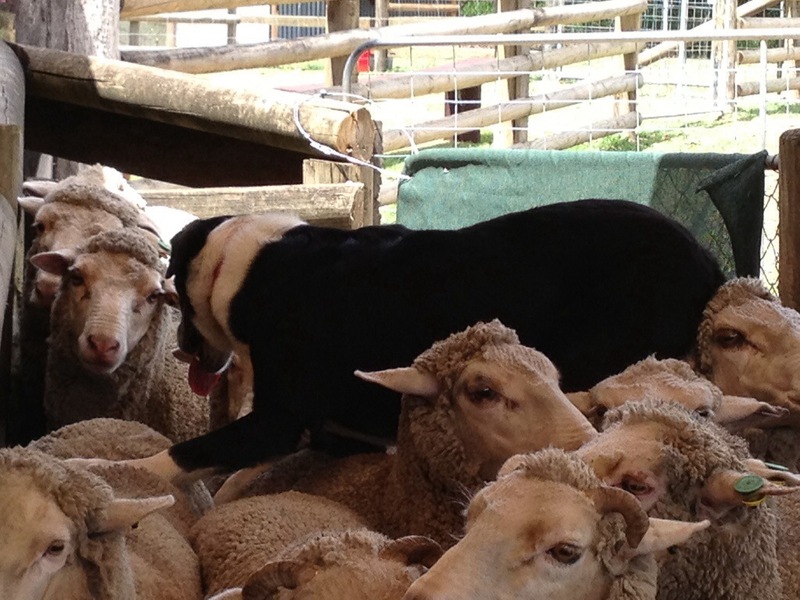 First, we had the chance to watch the sheep dogs round up the sheep. 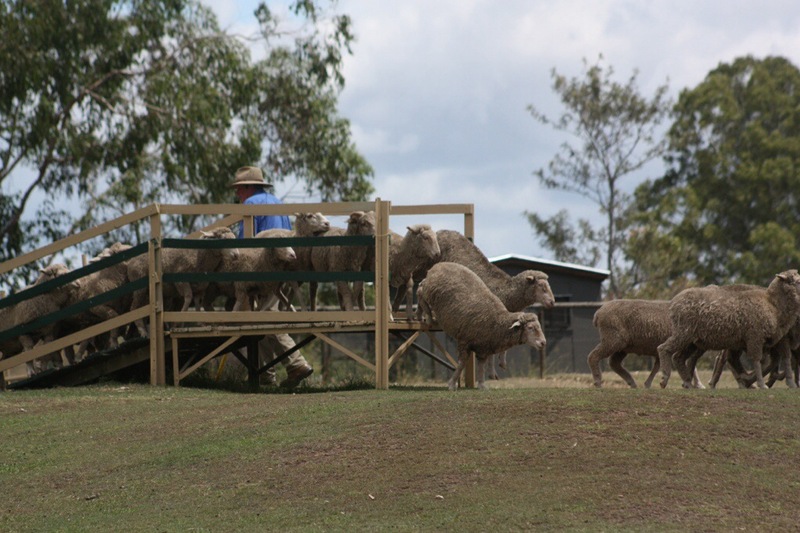 He actually sat on top of the sheep in the pen once he was done his work….this is so he doesn’t get stepped on in the pen! 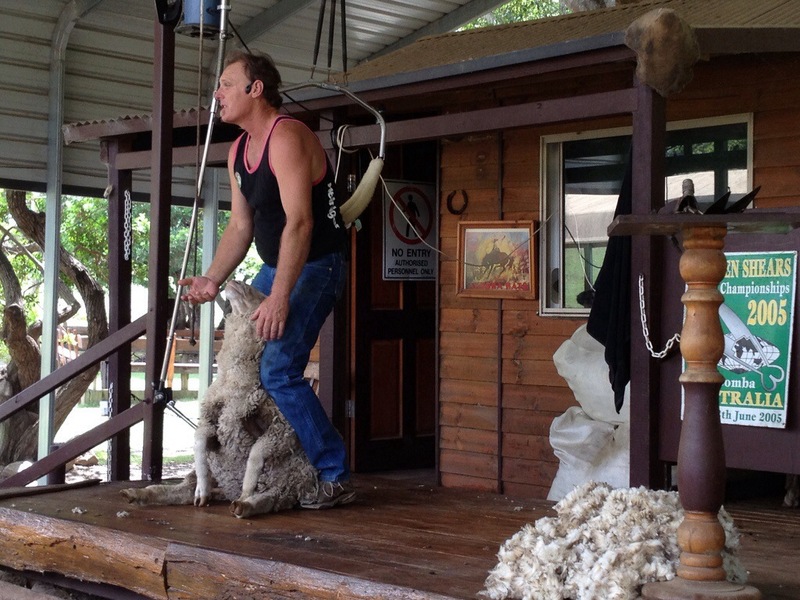 Next we watched a very leary Merino sheep get sheared. 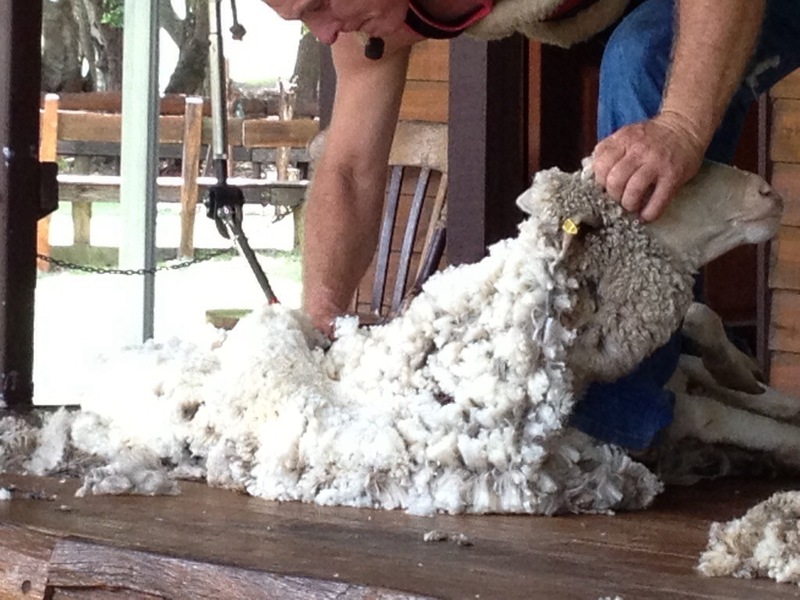 Apparently, they are sheared once a year. 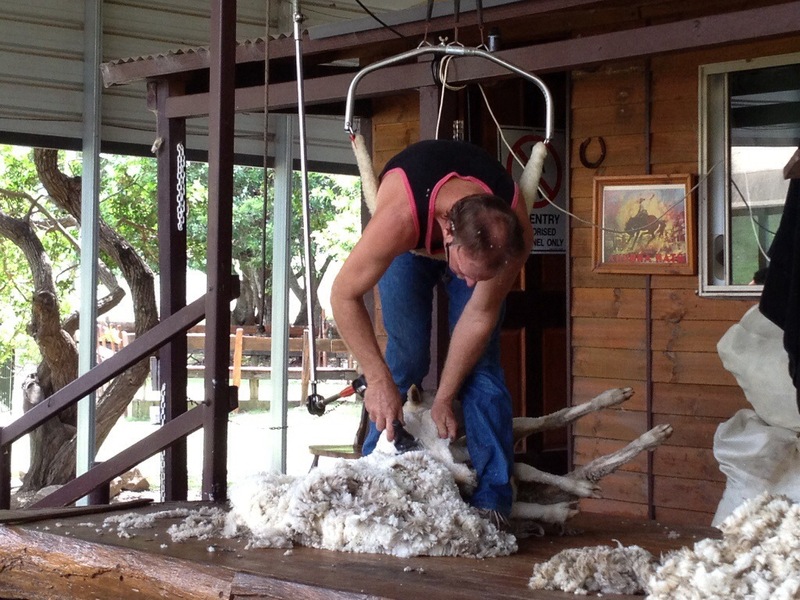 The sheep shearer get $2.10 for each sheep sheared. 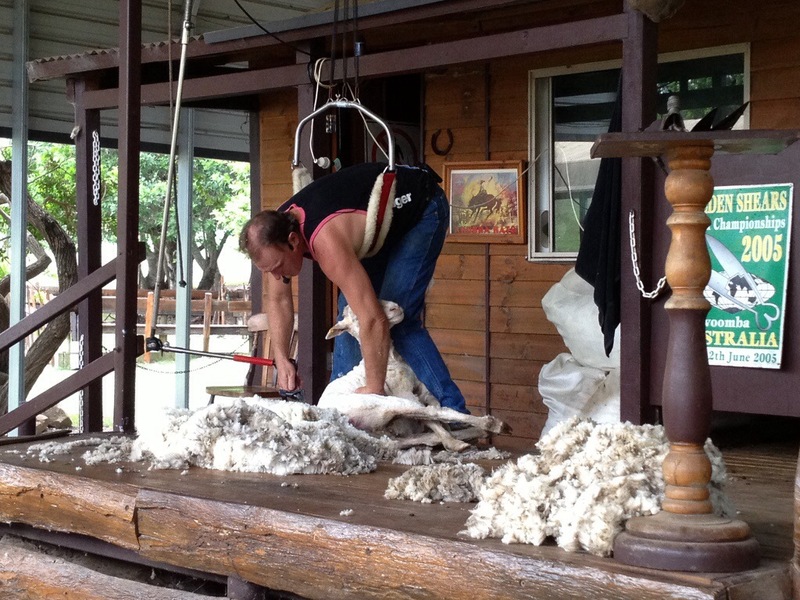 On average, a good shearer can shear about 209 sheep a day. 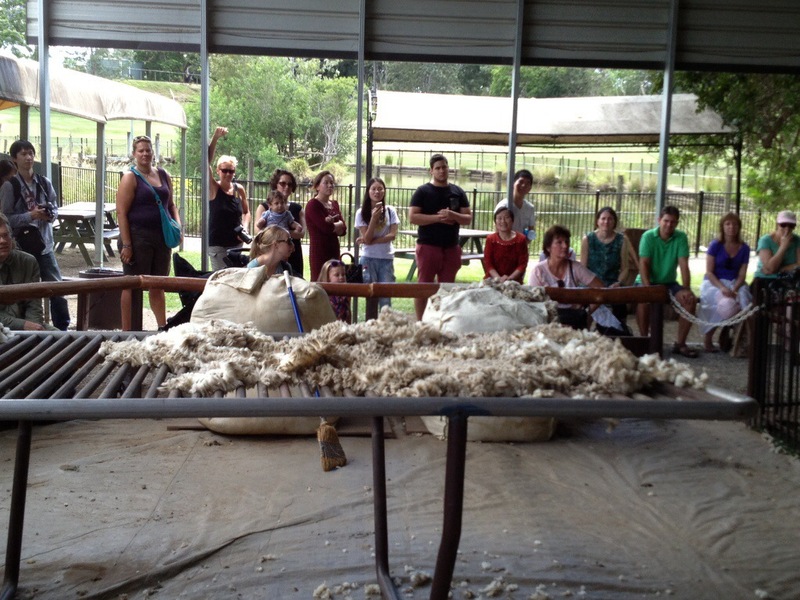 The wool was super soft- and stinky! 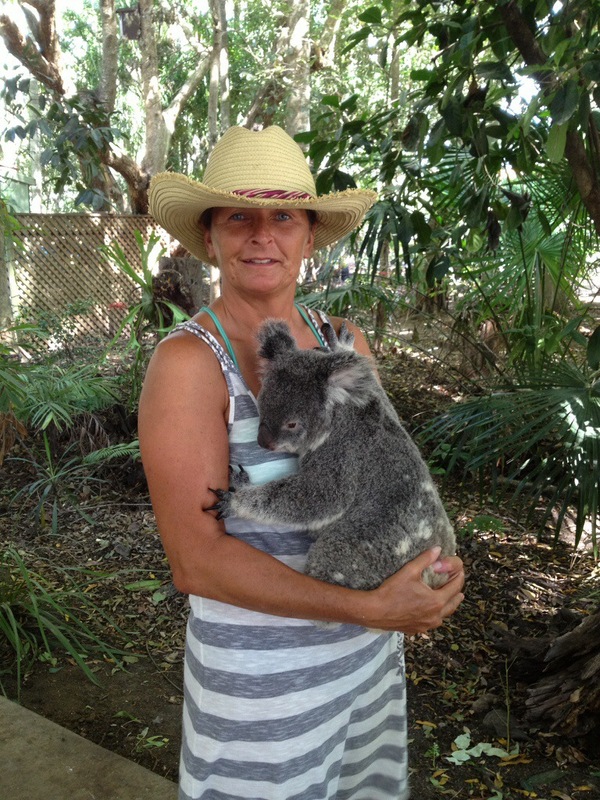 On to…..the koalas! These guys are absolutely adorable. 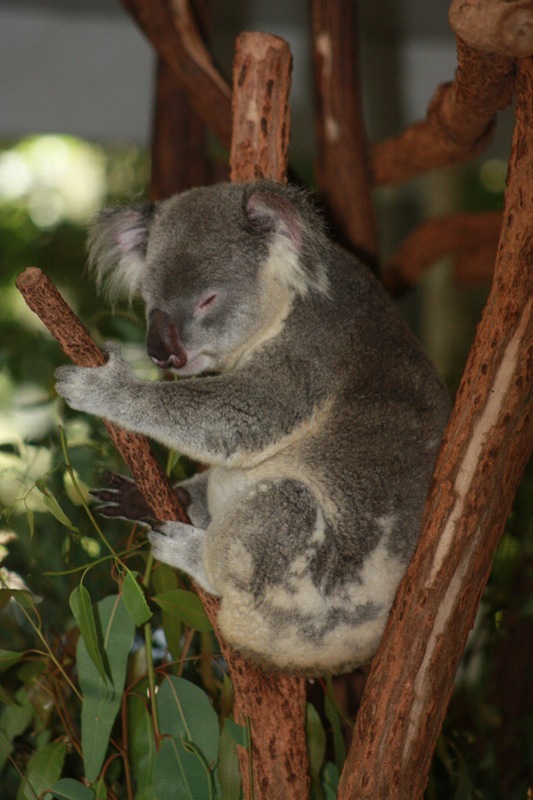 They spend 20 hours a day sleeping because the eucalyptus leaves they eat give them limited energy, and their bodies use a ton of energy to digest the toxic leaves they love to eat. Can’t even decide which pix to add here as they are all so cute! 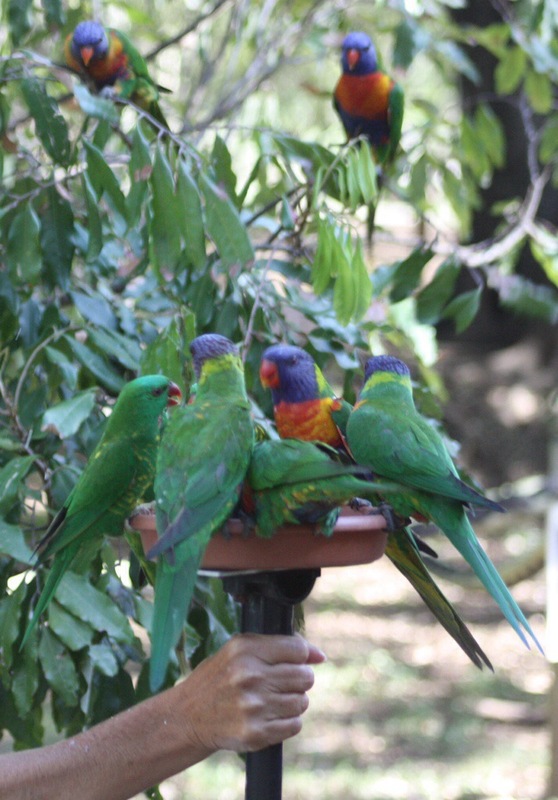 The lorikeets were super cool too. 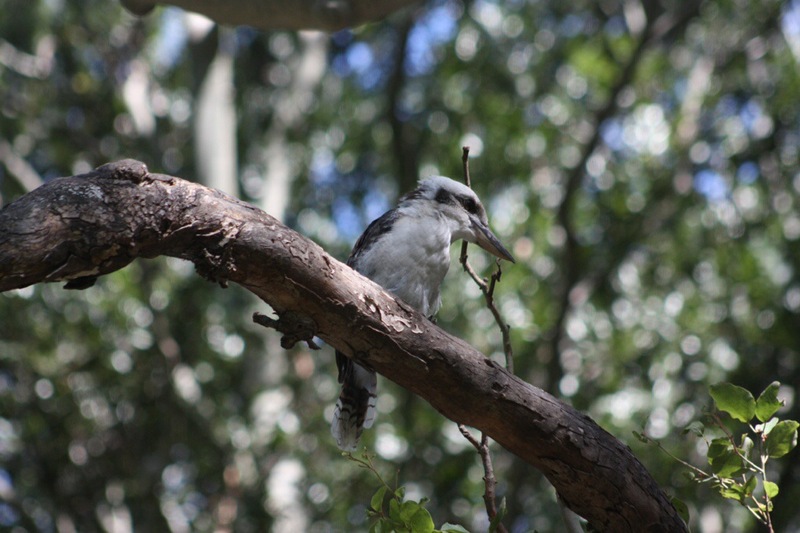 We’ve seen these guys all down the Sunshine Coast by the hundreds and they are sooooo loud. 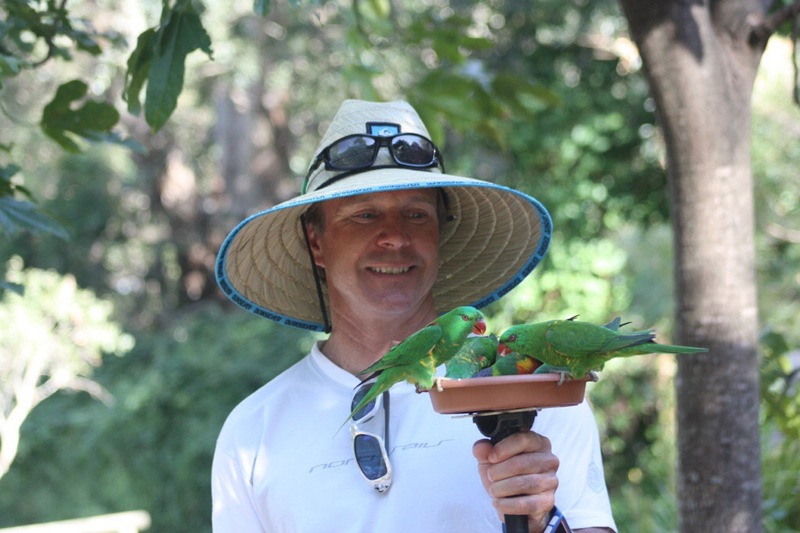 The ones here are wild and if you hold a feeder in your hand, they will fly down and eat out of it. 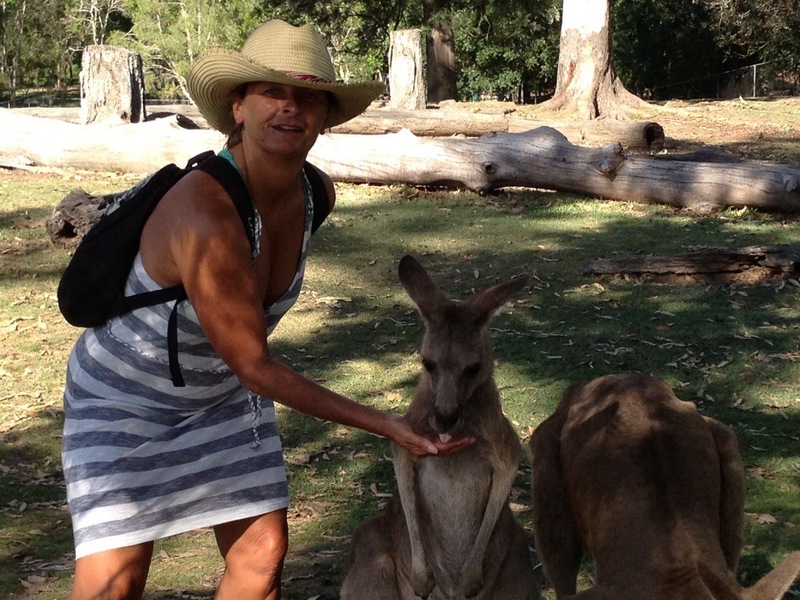 Of course, we can’t forget about our bouncing friends, the Grey and the Red Kangaroos and wallabies. These cuties were in a massive fenced field area. We were allowed to go in and wander about. 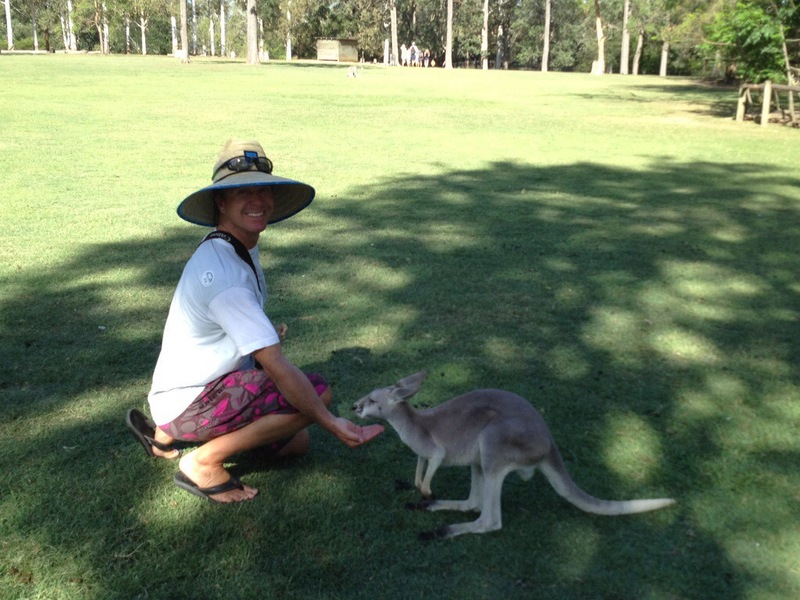 The joeys were adorable. 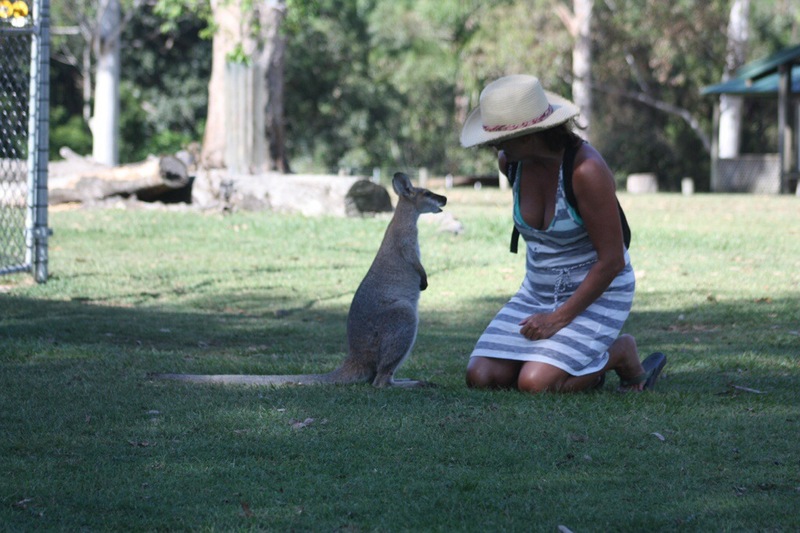 They’d just hop,over to you and eat out of your hands. 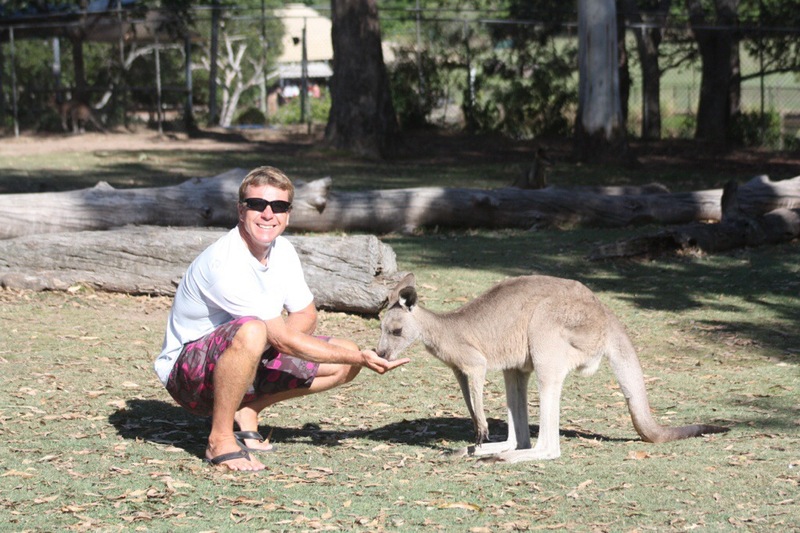 After an amazing afternoon here, we are completely satisfied that we’ve been able to see all of these amazingly unique Australian animals. 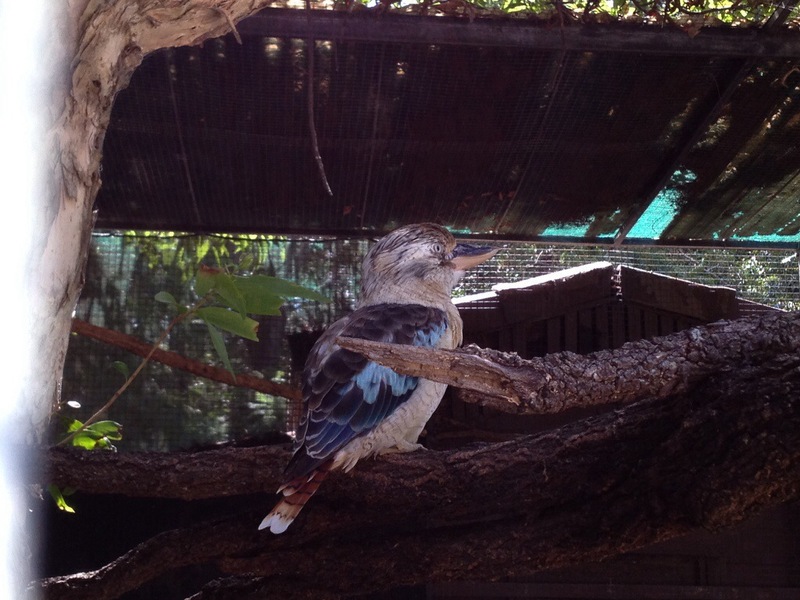 We hope that they stay protected so that many more generations to come can experience these wonderful creatures. 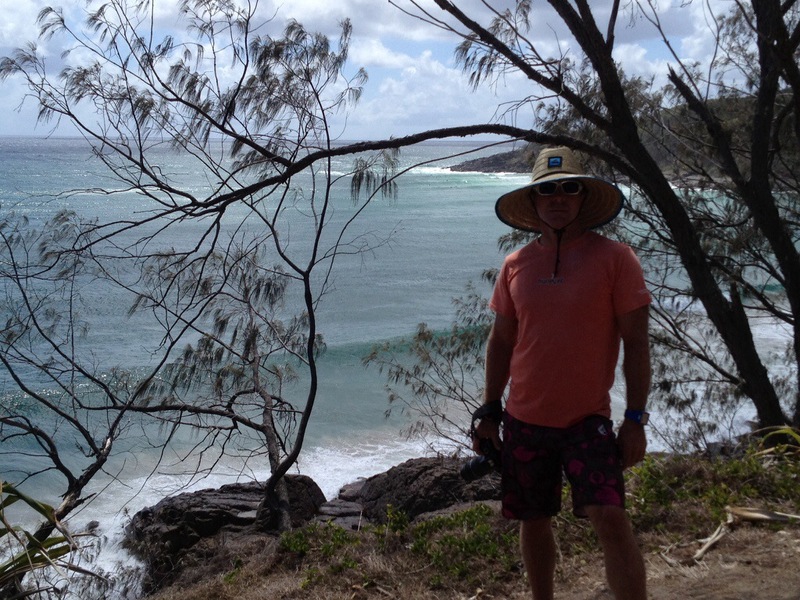 Well, after those awesome days on Fraser Island, it was time to hit the road again. 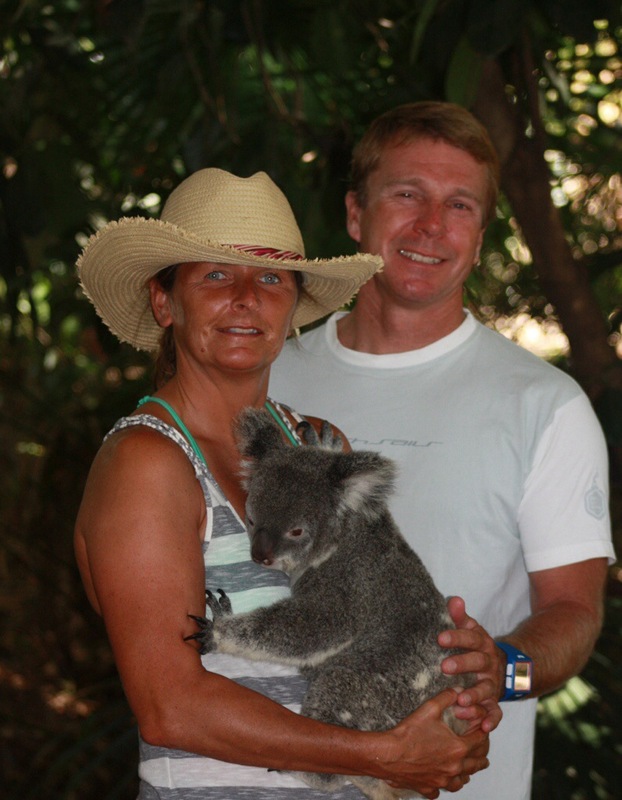 FINALLY we were headed to the surfing portion of our time in Oz. Keep in mind that the waters up to this point are unsafe during these months because of the dangerous jellyfish. 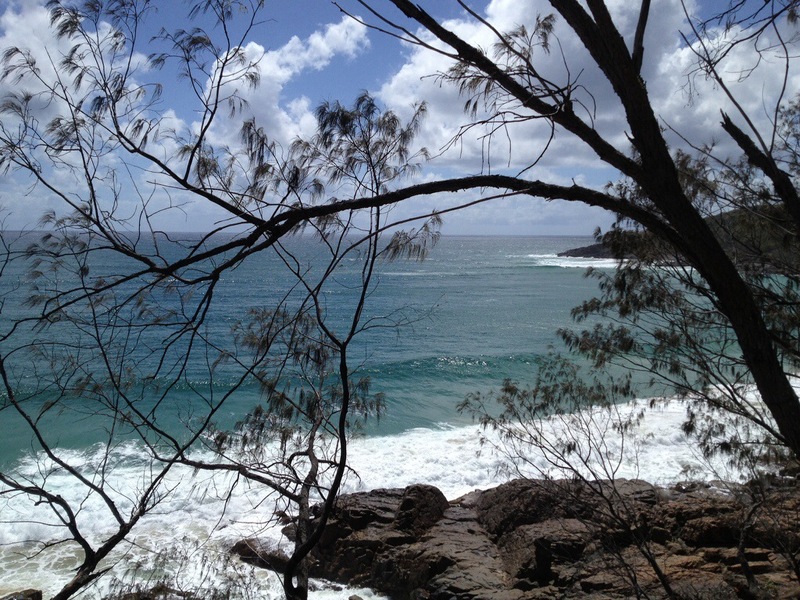 Also, there is no surf up here because the islands of the Great Barrier Reef block the surf. 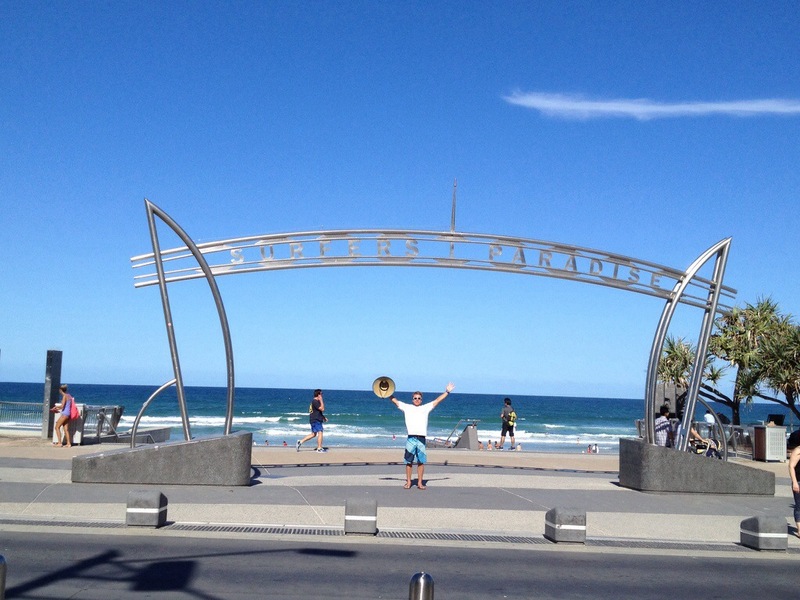 It was a three hour drive south to get to a Sunshine Beach where we would be staying for the next week. Just like the online pictures, the place was beautiful, a 5 minute walk to the beach and had an awesome tv so we could get our Olympic fix. 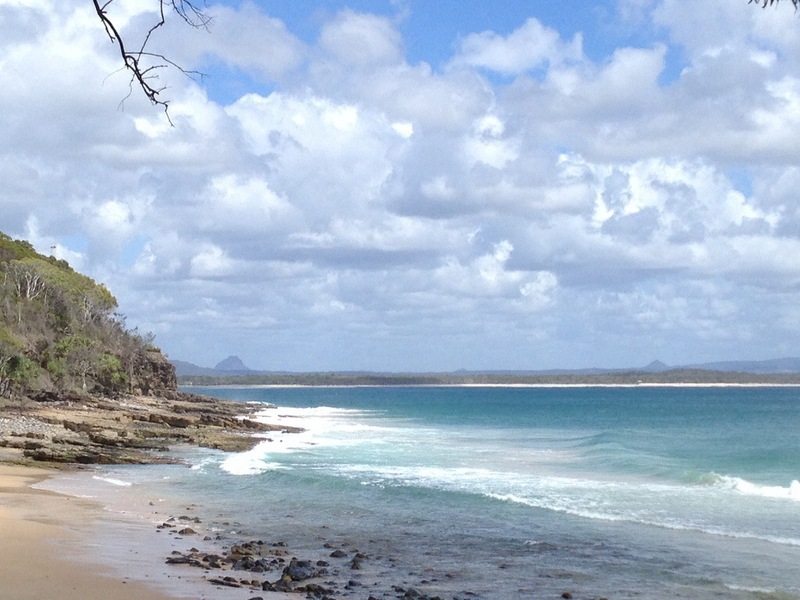 We’d pulled in late in the afternoon and the winds were up at Sunshine a Beach so we headed down the road to Noosa. 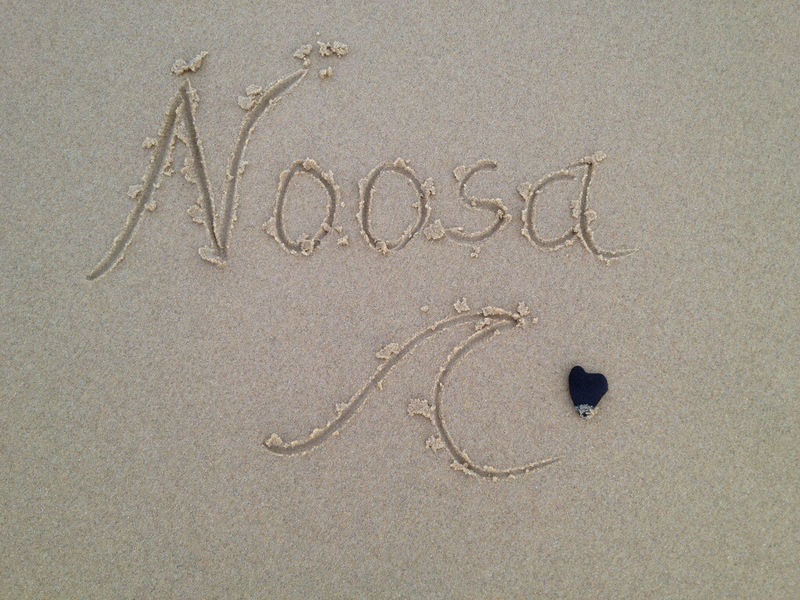 Noosa Heads is a cool surf town, mixed in with some high end retail and spendy beachfront hotels. 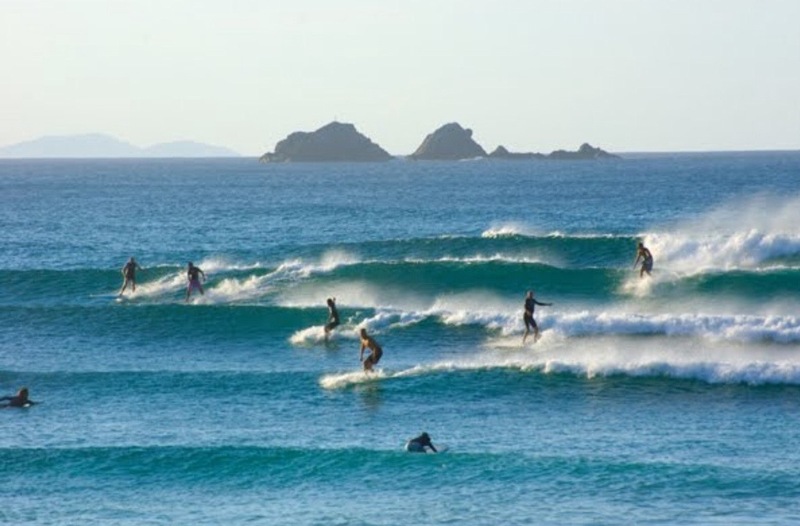 It also is renowned for it’s many great surfing spots, especially some of the point breaks there. 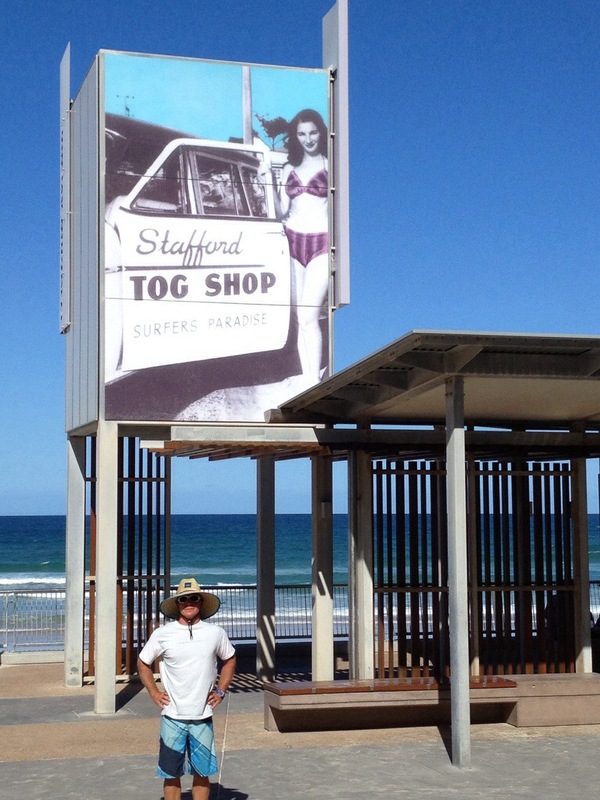 We enjoyed a fun surf session and then hit the town for some big straw hats. 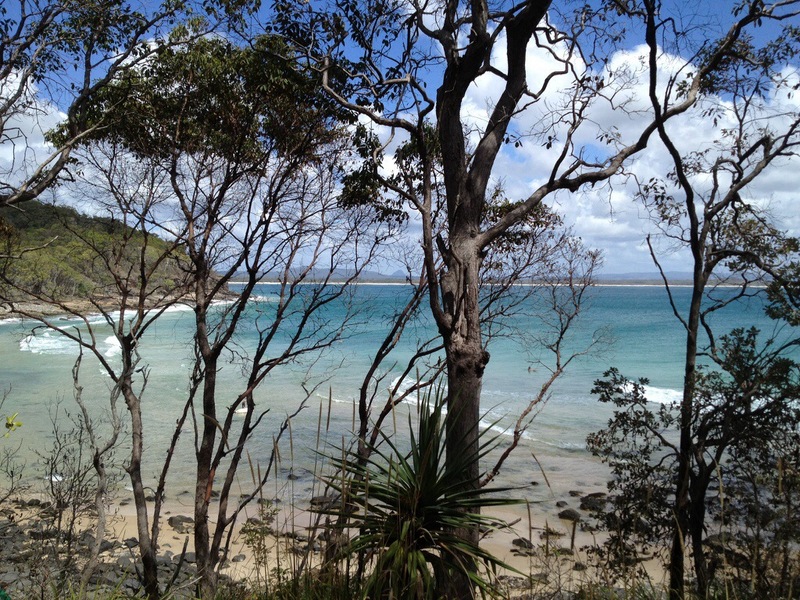 The difference between where we’d been and Noosa was incredible in terms of the intensity of the sun. We could barely be outside for more than 10 minutes in direct sun without a hat and sunscreen. There were hat displays in pretty much every store, including the chemist (pharmacy). 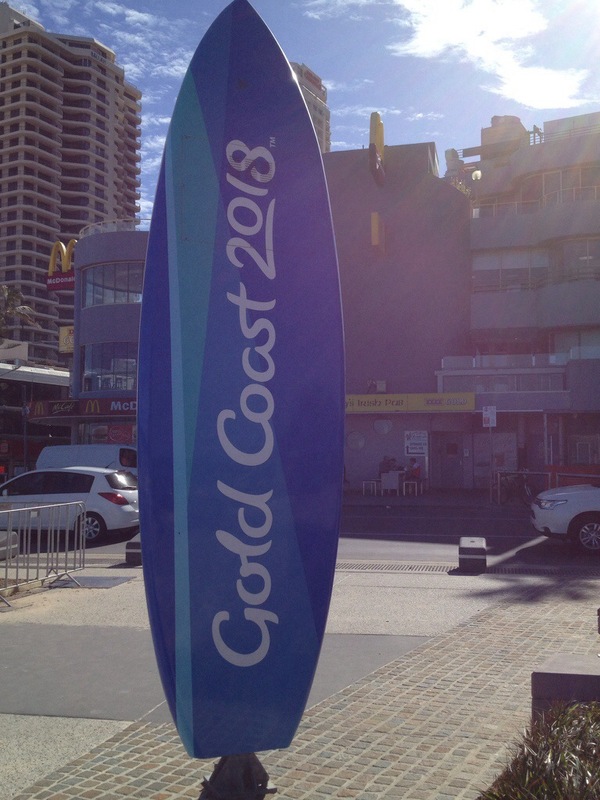 Early mornings, were spent surfing and then we’d head back to the condo for some food and Aussie Olympic coverage….pretty sad compared to Canadian coverage, but we still caught many incredible Canadian performances. 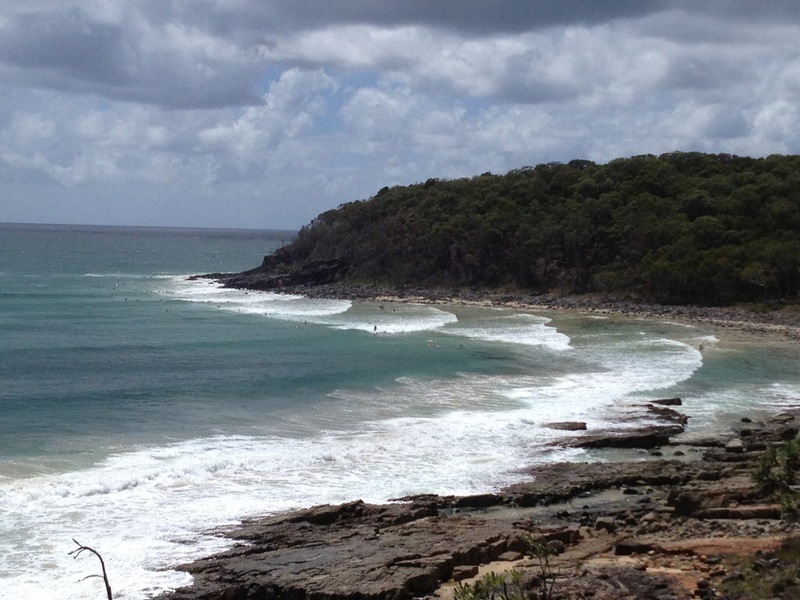 Later in the afternoons we’d head back to the beach to catch an afternoon surf session. 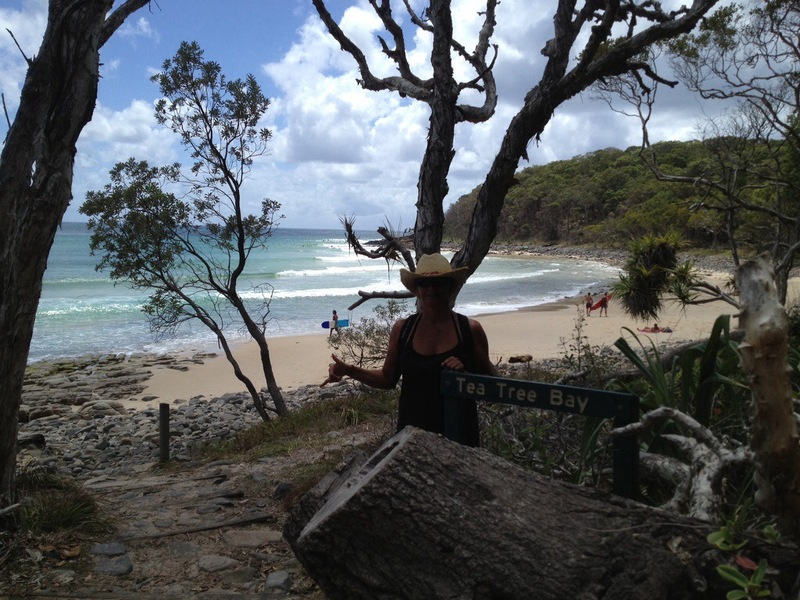 One morning, we had decided to check out Tea Tree Bay, one of the surf spots. 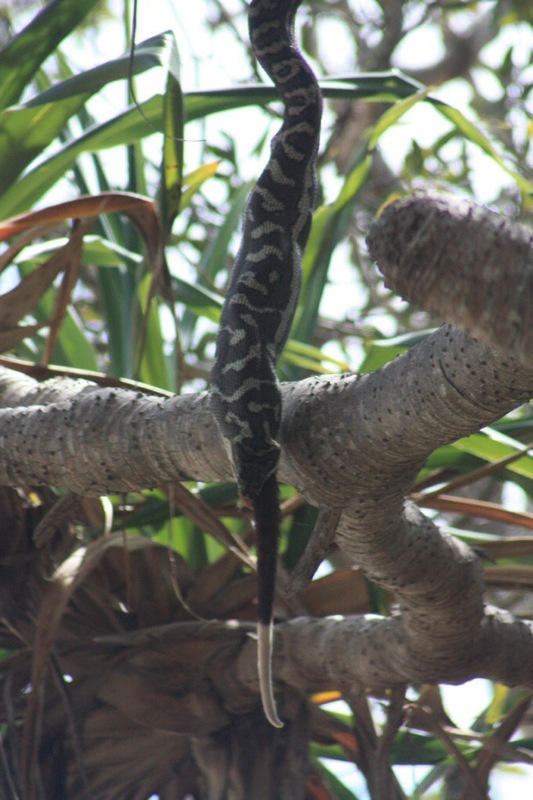 It is in Noosa National Park and about a 10 minute walk along a well used paved pathway. 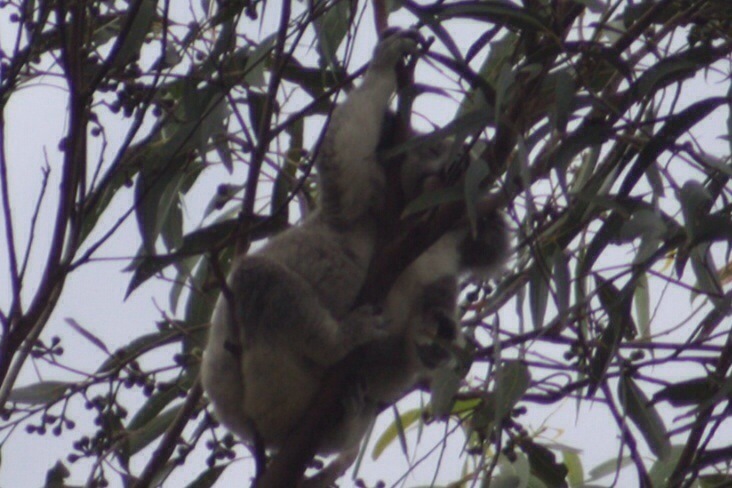 This particular morning, we’d brought our 300mm lens with the camera as I was on a koala spotting mission. 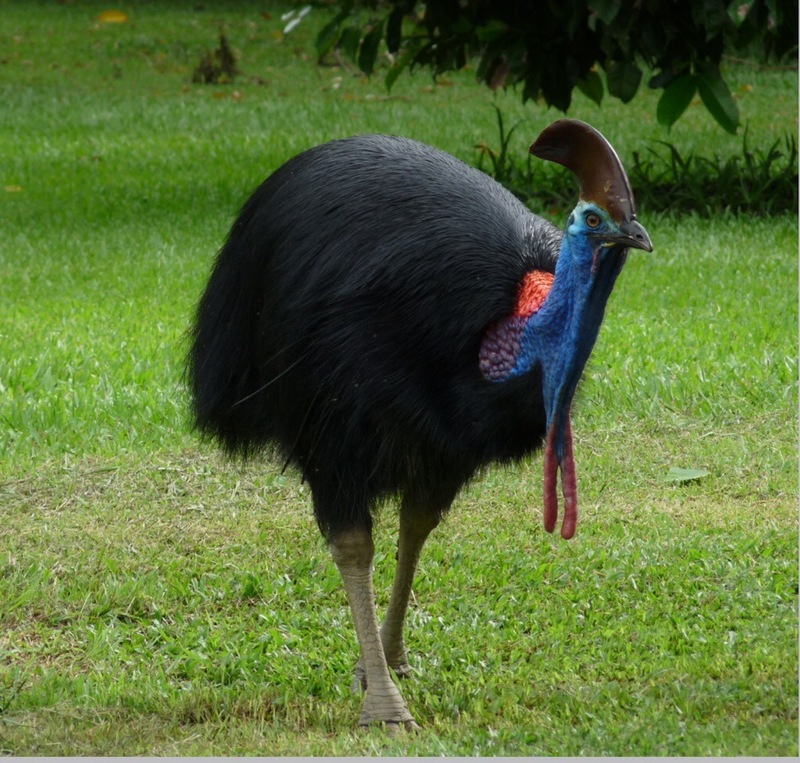 Apparently they are sighted fairly frequently around the park. Our eyes were trained upwards searching for these cuties as we walked. 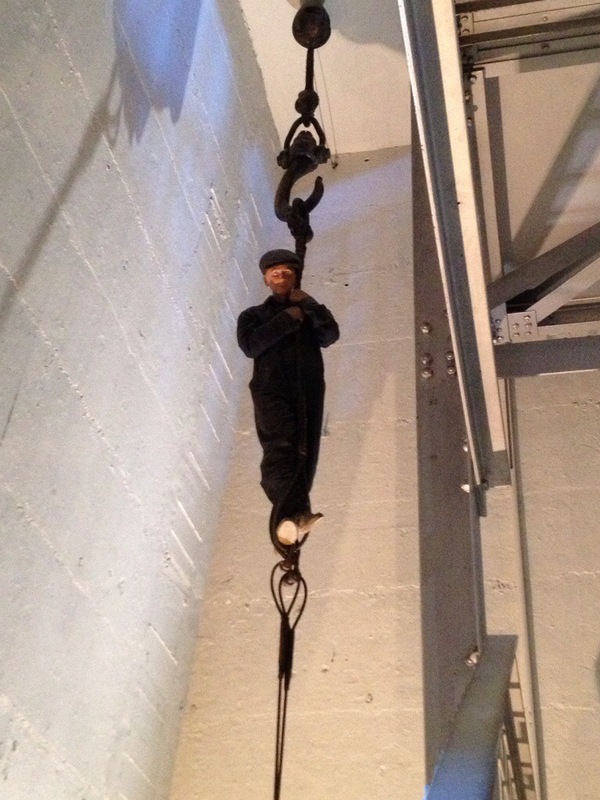 As I was looking up I spotted something move and did a double take…. 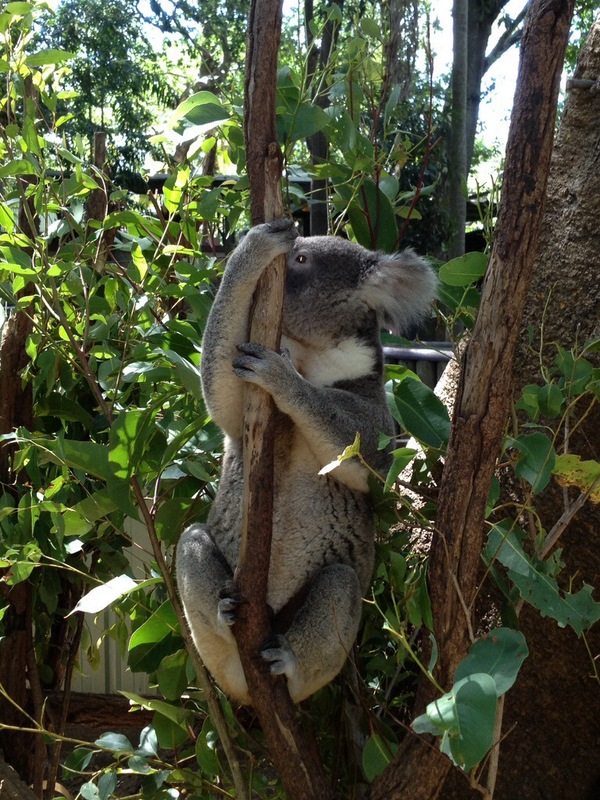 This was no koala. 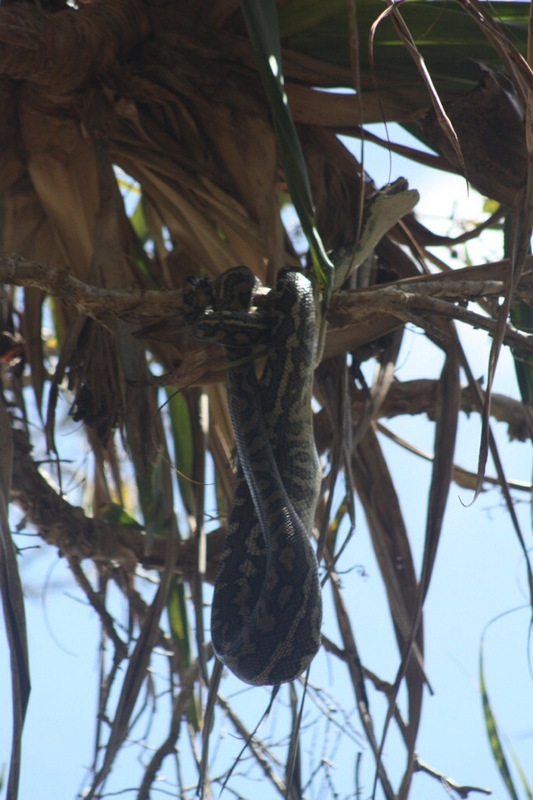 It was a massive carpet python hanging from a tree branch. Dan figures it was between 2-3 meters long. 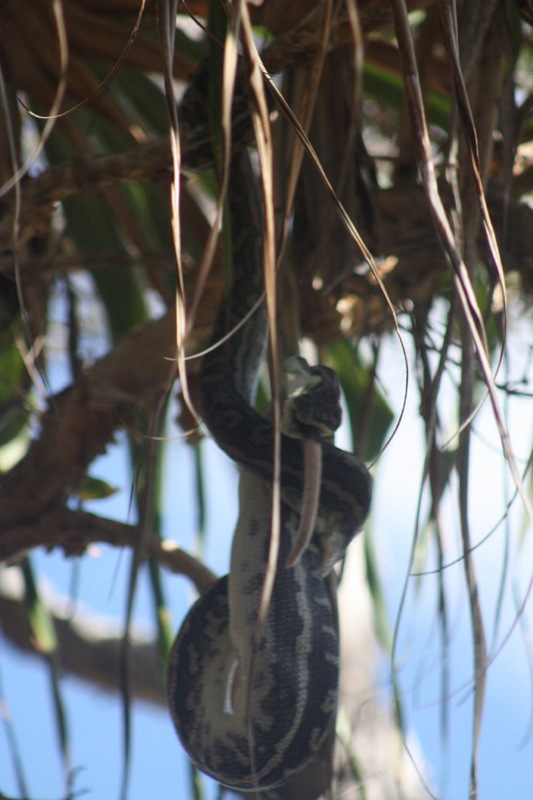 As Dan came back to check it out, I realized it had something in its mouth. 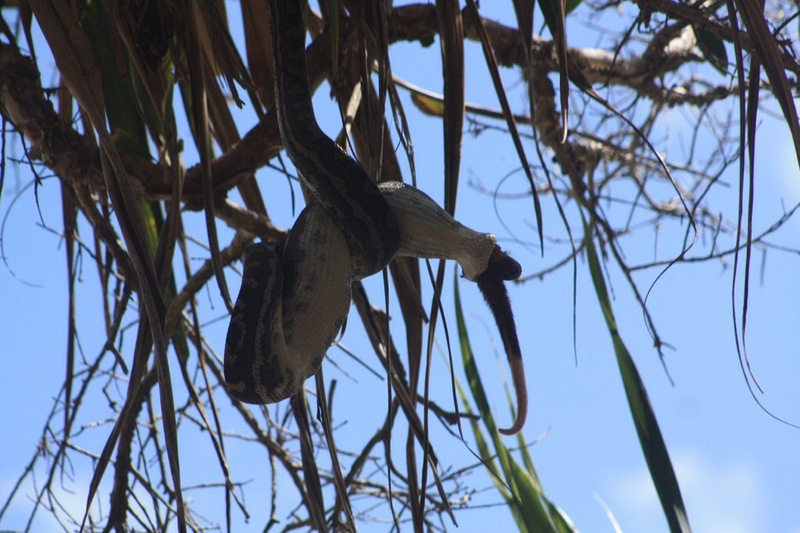 Sure enough, you could see part of a body and a long tail hanging out the mouth. I guess this possum hadn’t moved fast enough this morning…. 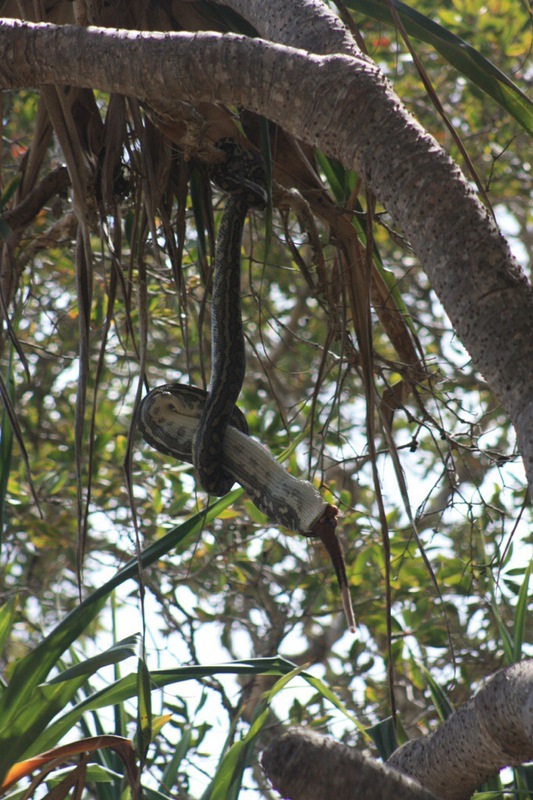 …definitely very cool to watch something like this in the wild, I think we stood there for 25 minutes…. 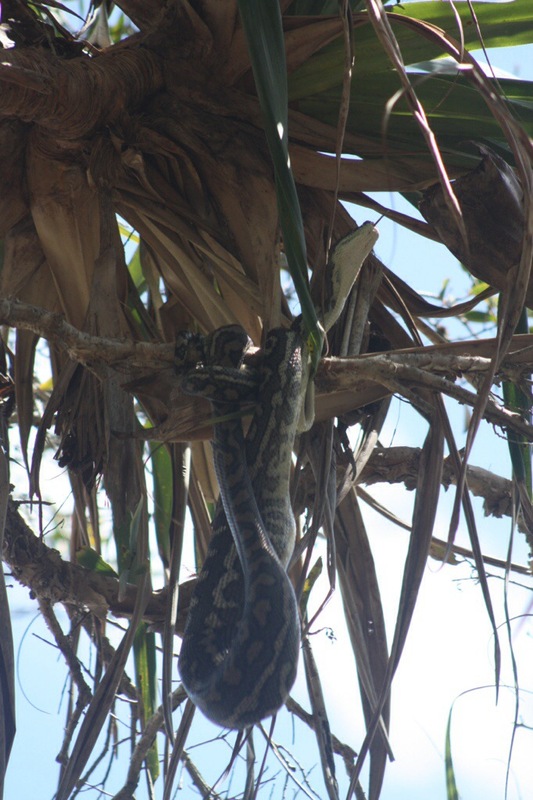 …we watched until we couldn’t see the poor little possum anymore and the snake wrapped around itself to constrict the possum, crazy morning! 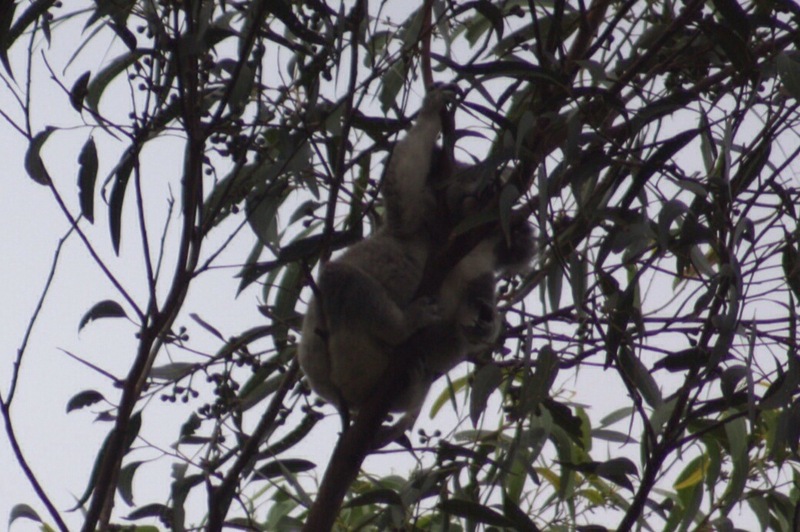 And guess what, we did spot a baby koala on the way back. 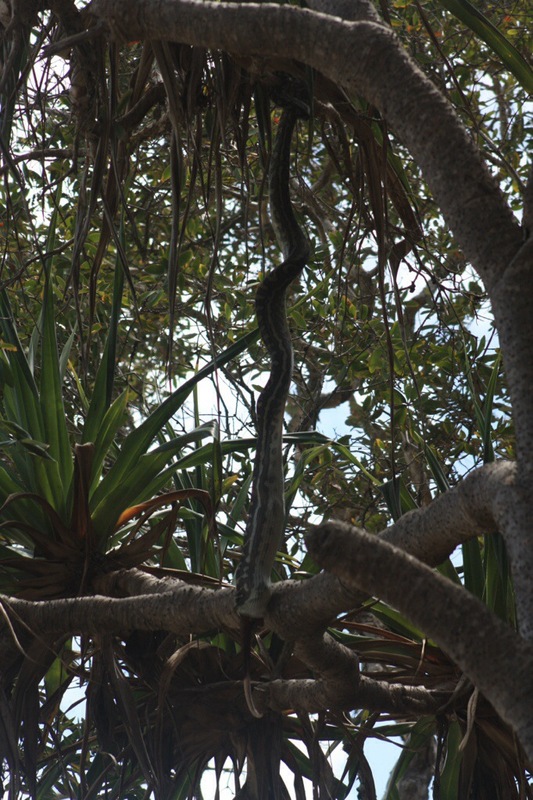 He was up in a gum tree about 25-30 meters. Hence, the shot! 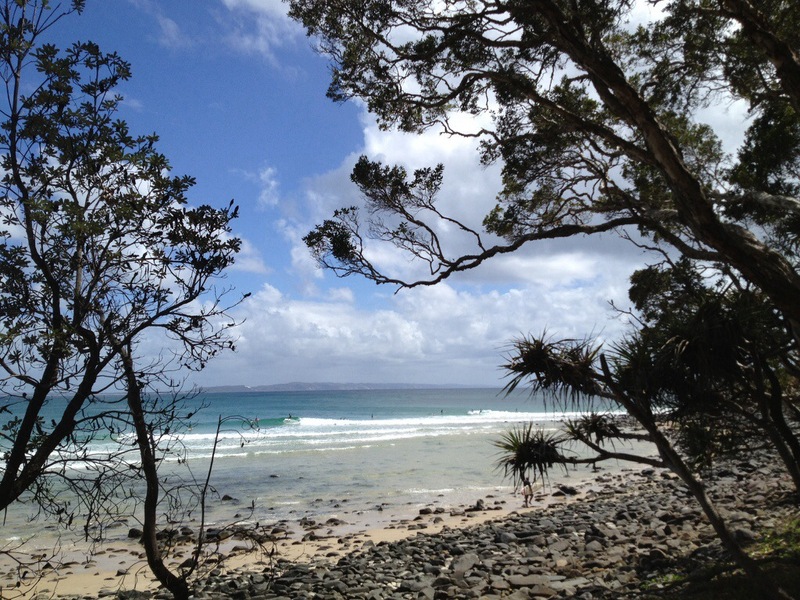 We had an awesome week in Noosa, despite the windy conditions every day that messed with the surf. 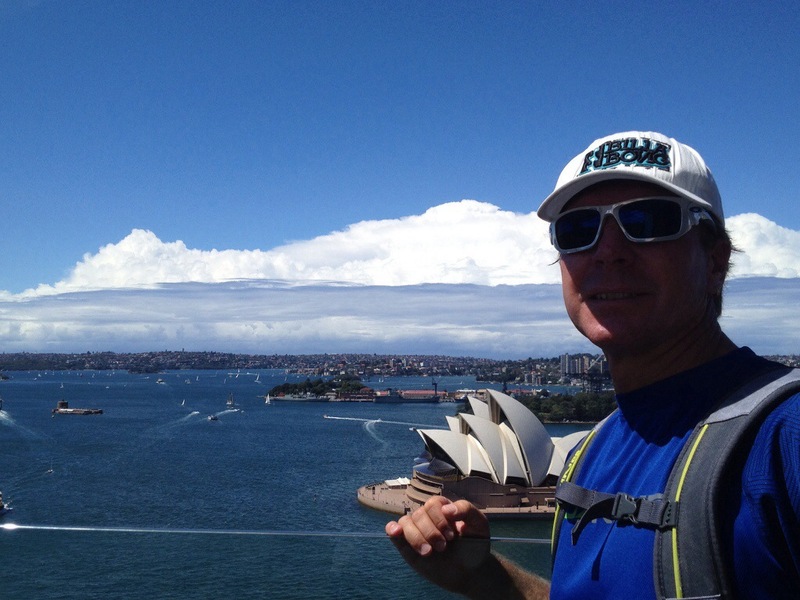 We thought about extending our stay because we loved it so much, but in the end decided to continue on our trek south! Oh, The Place We’ve Been!